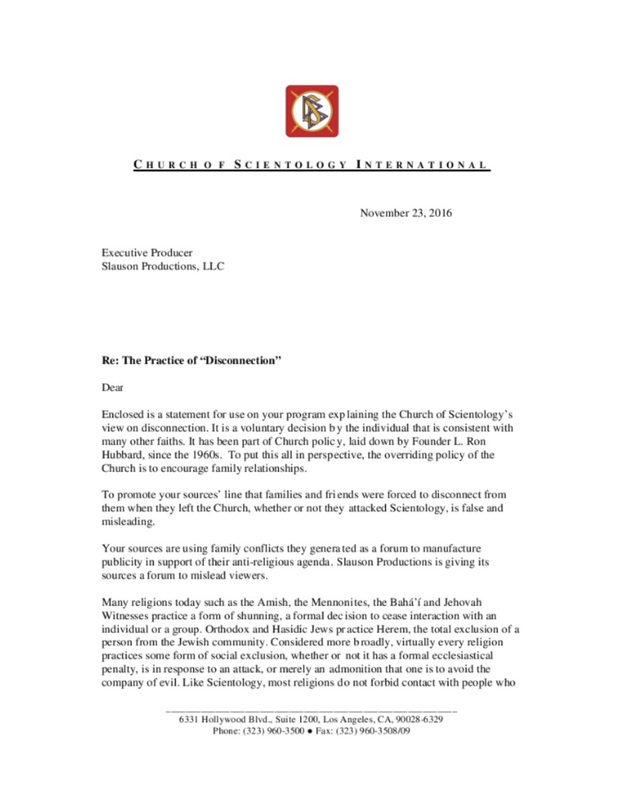 During the production of the Leah Remini: Scientology and the Aftermath ("Aftermath") series, representatives of the Church of Scientology International ("CSI") sent the producers a number of letters that included the Church's response to some of the information it anticipated would be in the program, and their character analysis and criticism of the principal subjects of each episode. 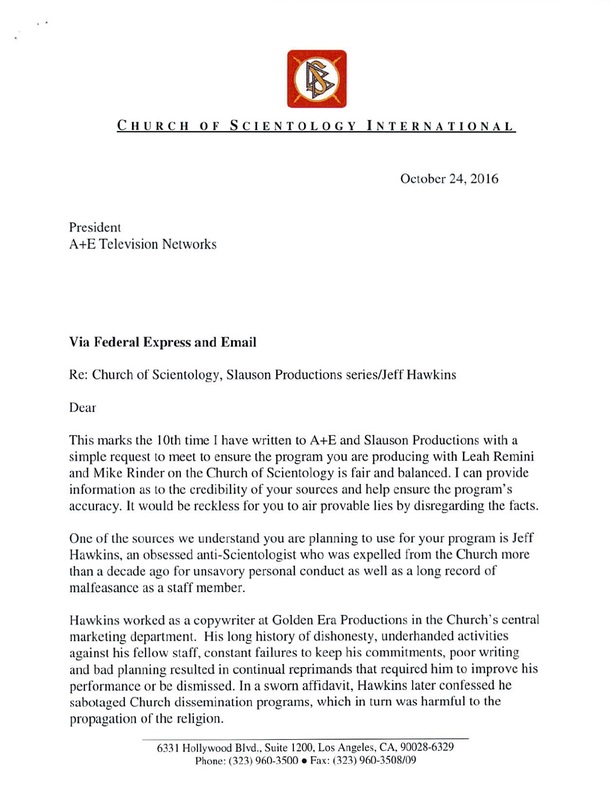 CSI has encouraged the production "to utilize the information provided to present a more balanced and accurate picture to [our] viewers." 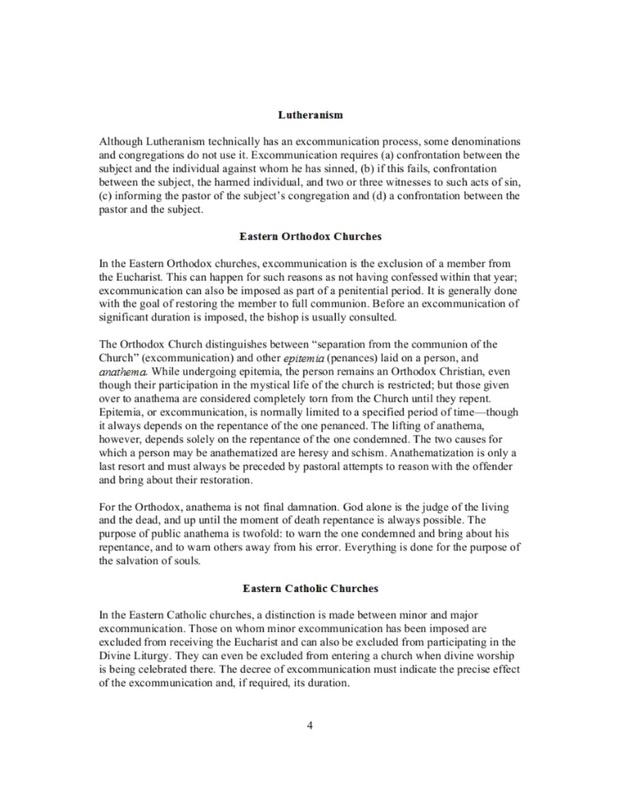 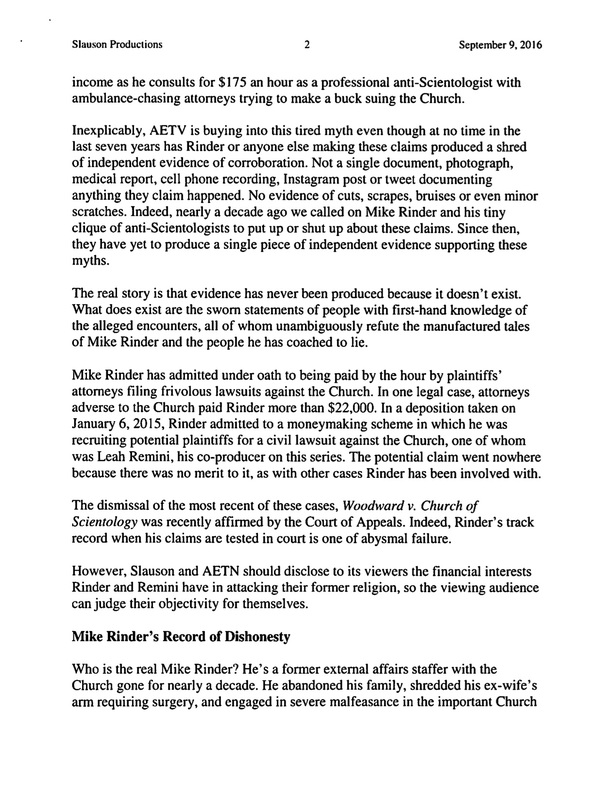 By sharing this information, A&E is not attesting to the veracity of the Church's claims, but has included them so that the Church's views are more fully presented. 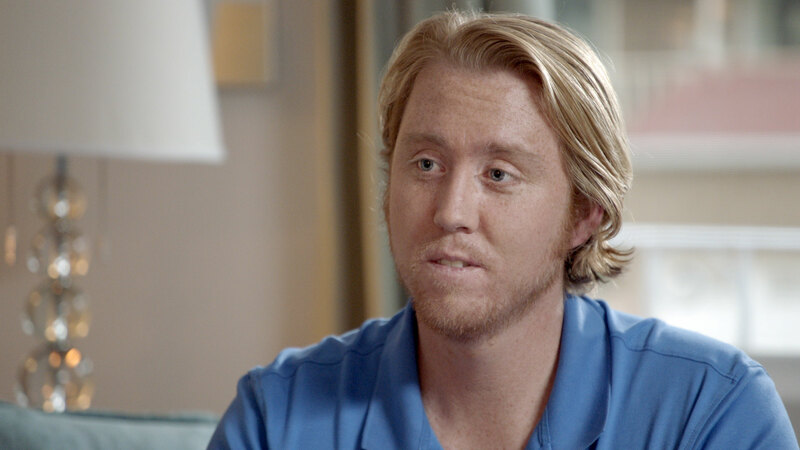 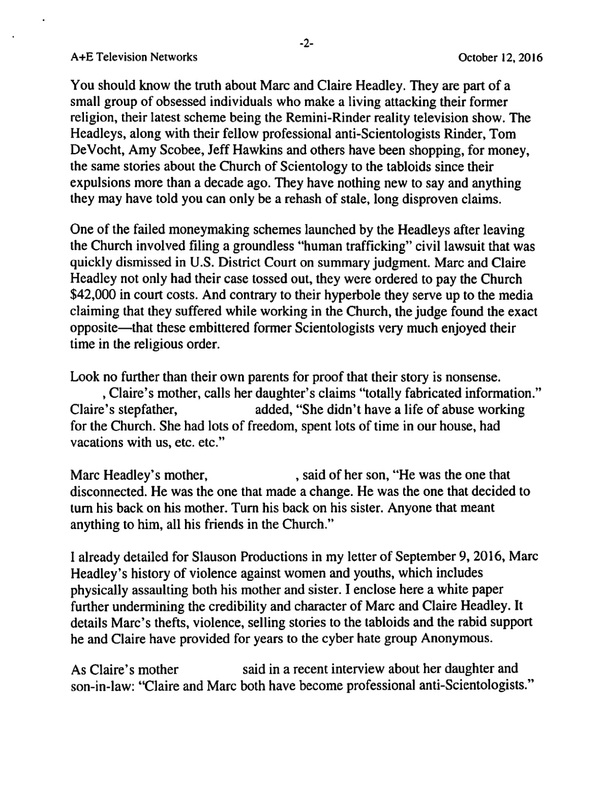 The seventh episode of "Aftermath" focuses on two primary subjects: (1) Brandon Reisdorf and his family's experiences with Scientology, mental illness, and his ultimate prosecution for vandalism of the Church of Scientology of Los Angeles, and (2) discussion among a panel of journalists who have reported on Scientology. 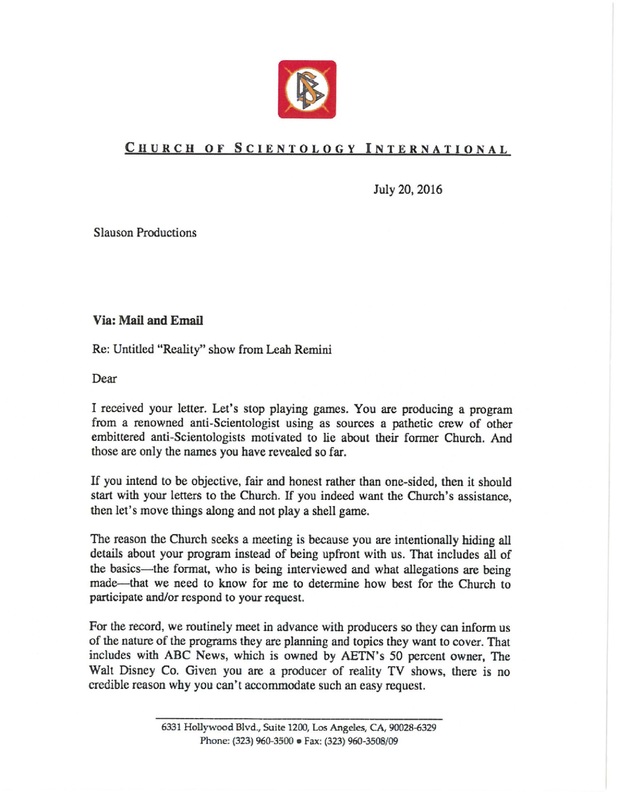 The Church did not send letters specific to any of the participants in this episode. 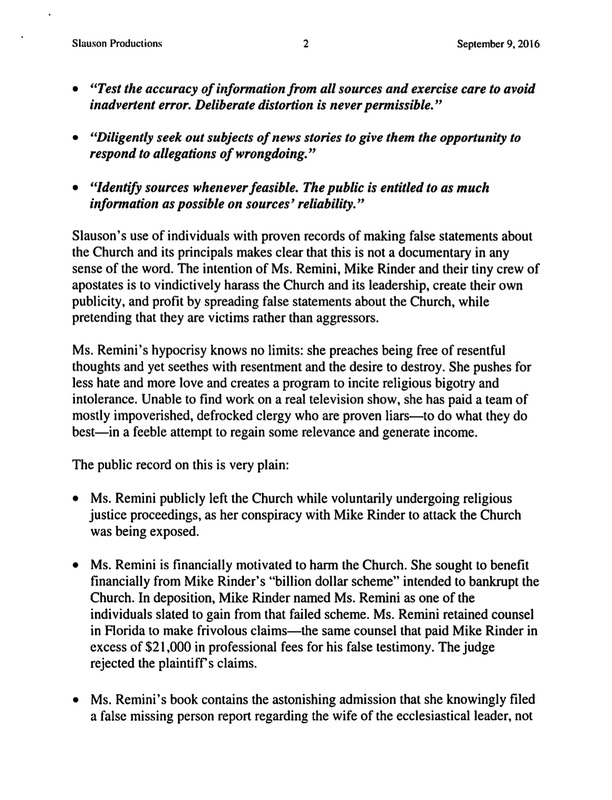 However, in a September 9, 2016 letter discrediting Ms. Remini (posted here under Episode 1), the Church discussed Brandon Reisdorf's arrest and suggested that Ms. Remini inspired his actions. 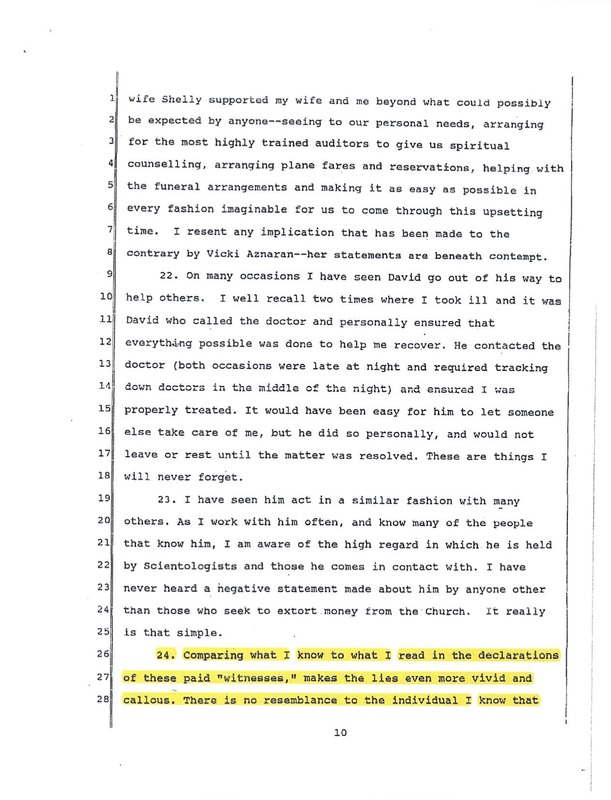 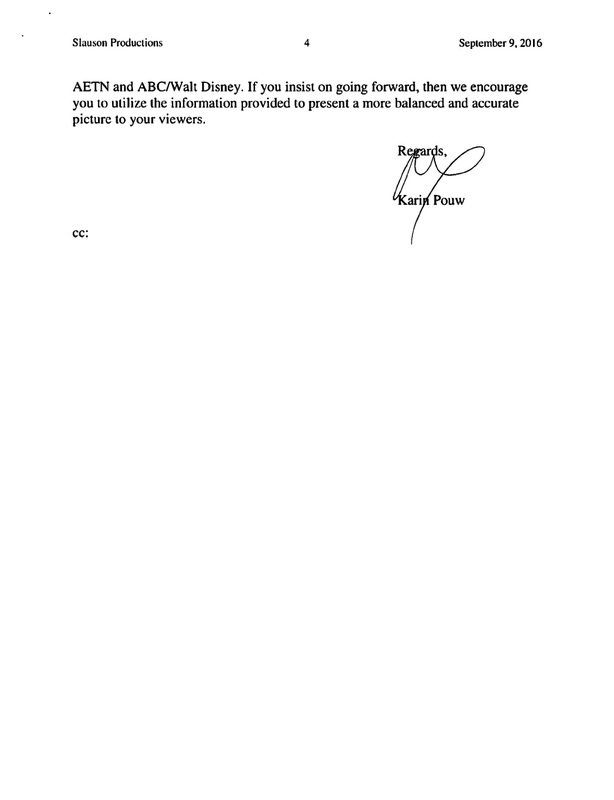 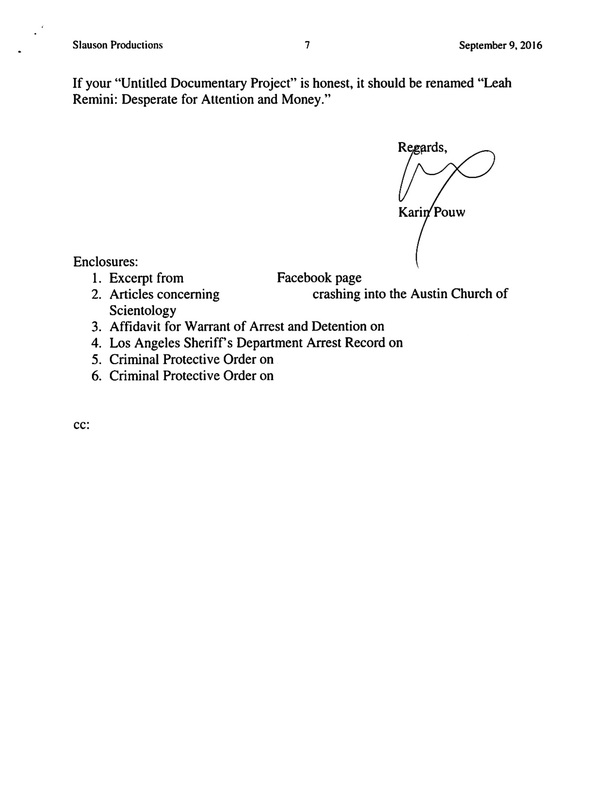 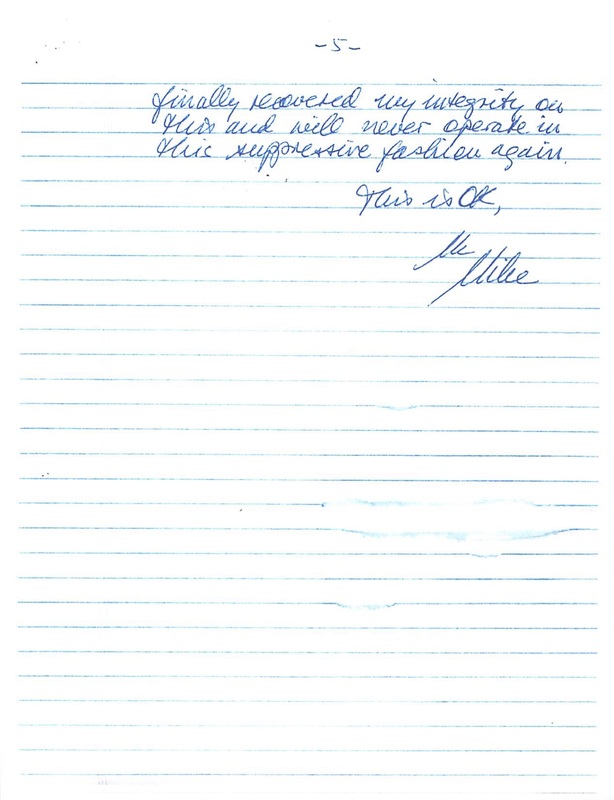 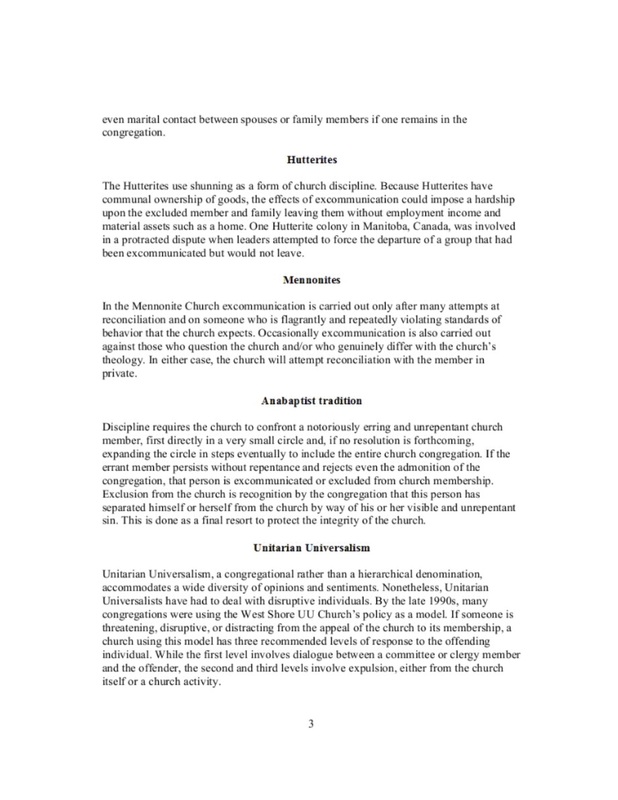 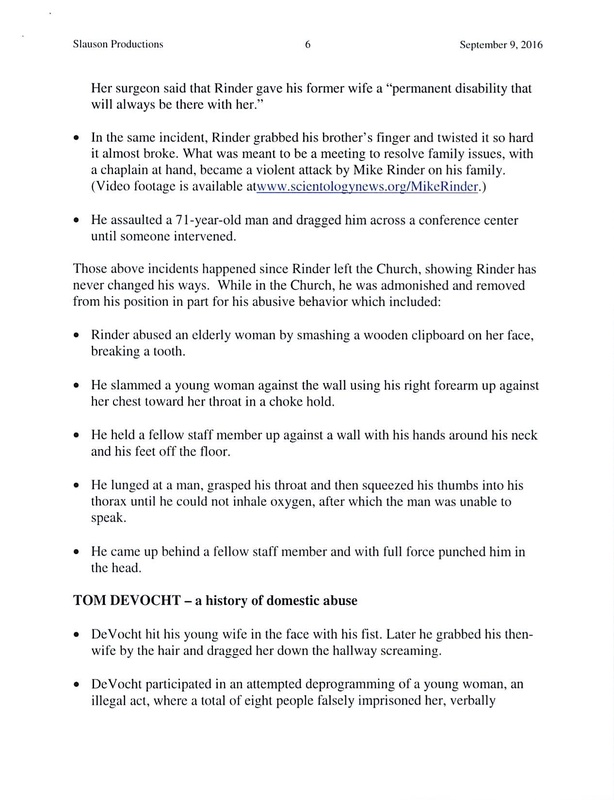 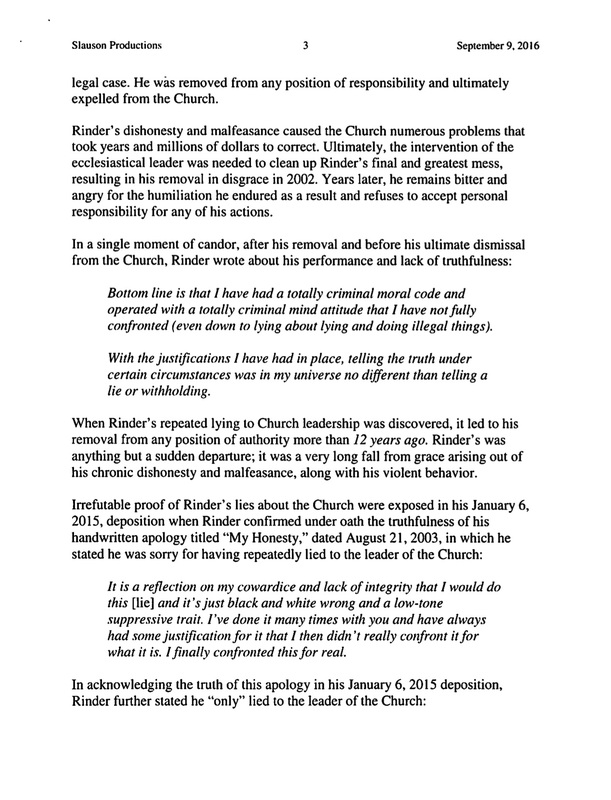 Below is the letter that includes portions pertaining to Mr. Reisdorf along with two documents provided by the Church that relate to the incident. 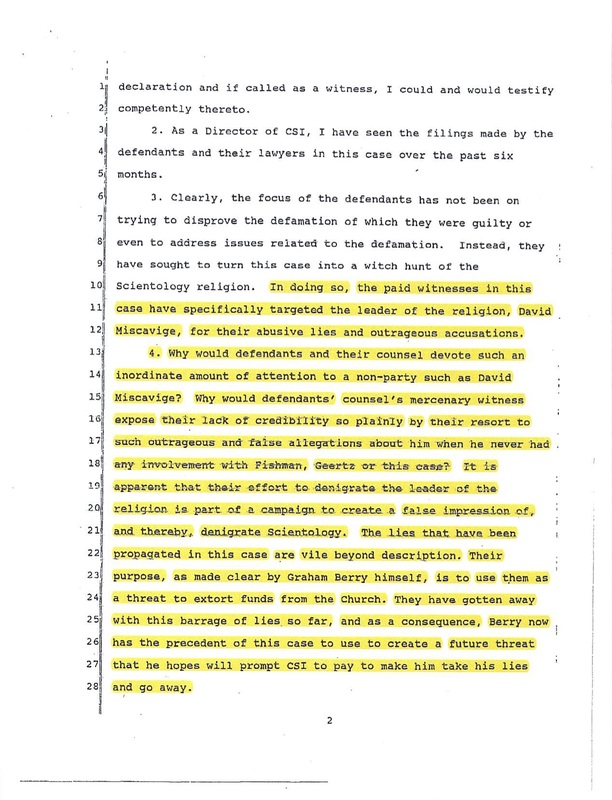 The sixth episode of "Aftermath" explores the recollections of former Sea Organization member Aaron Smith-Levin about his introduction to and ascent through the Sea Org, as well as his gradual disaffection from and disconnection from CSI. 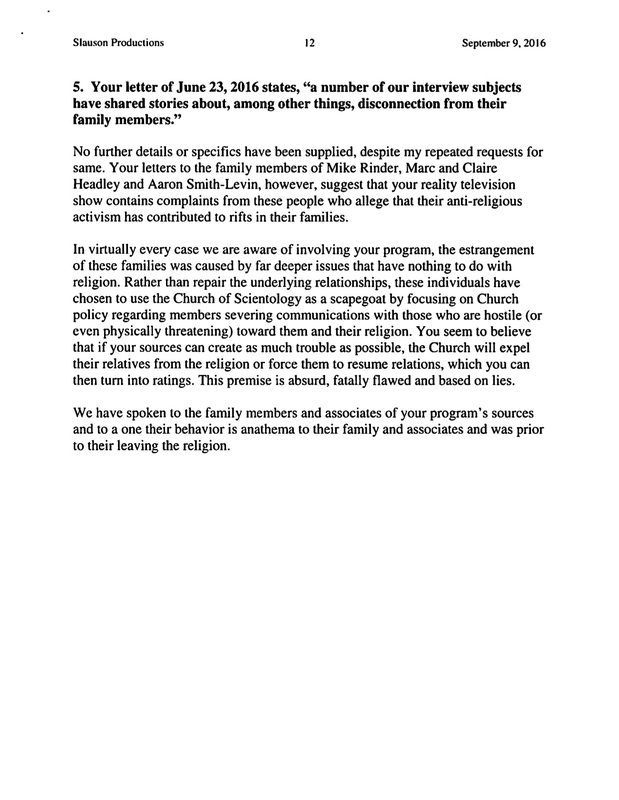 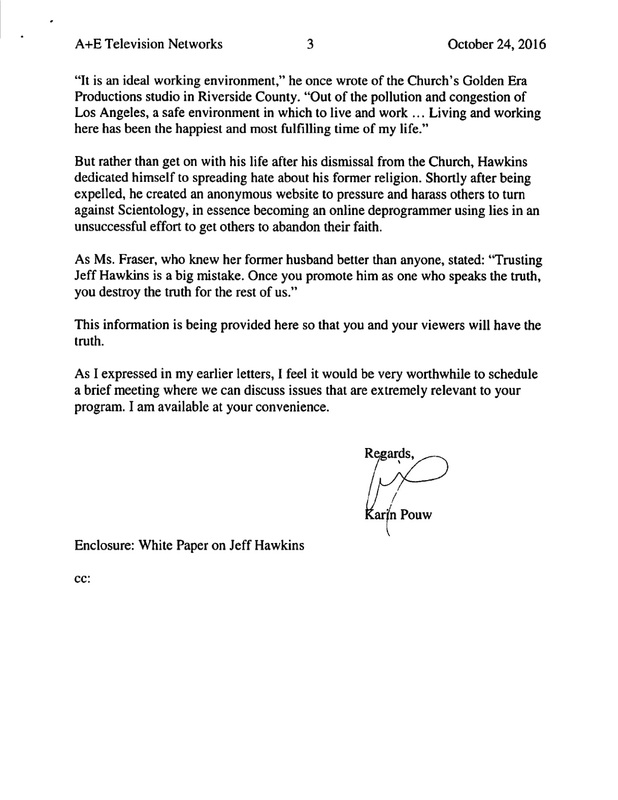 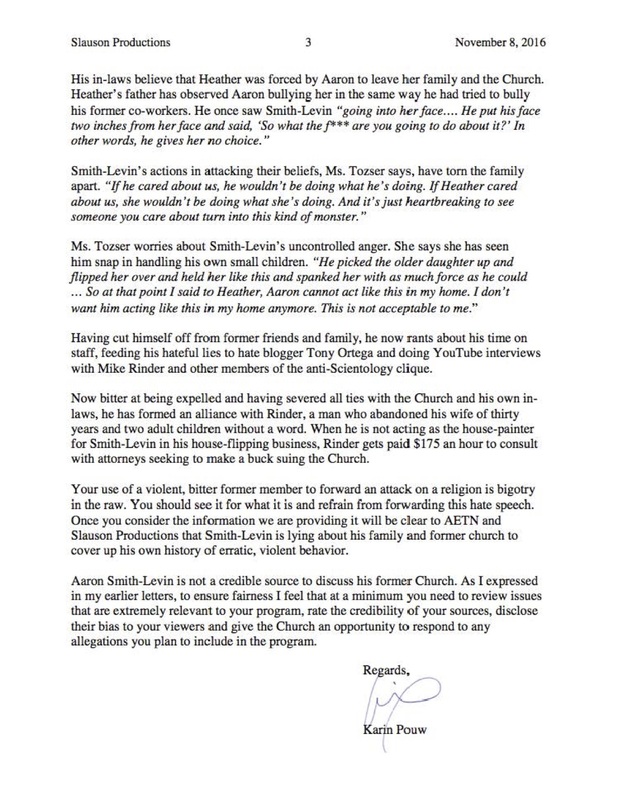 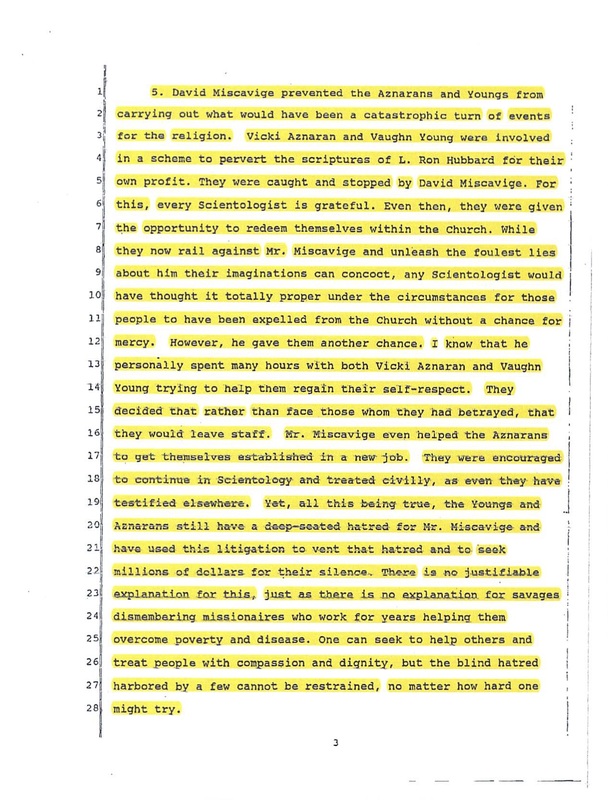 After requesting an interview from Mr. Smith-Levin's in-laws who remain members of the Church, the "Aftermath" production received a letter from the Church. 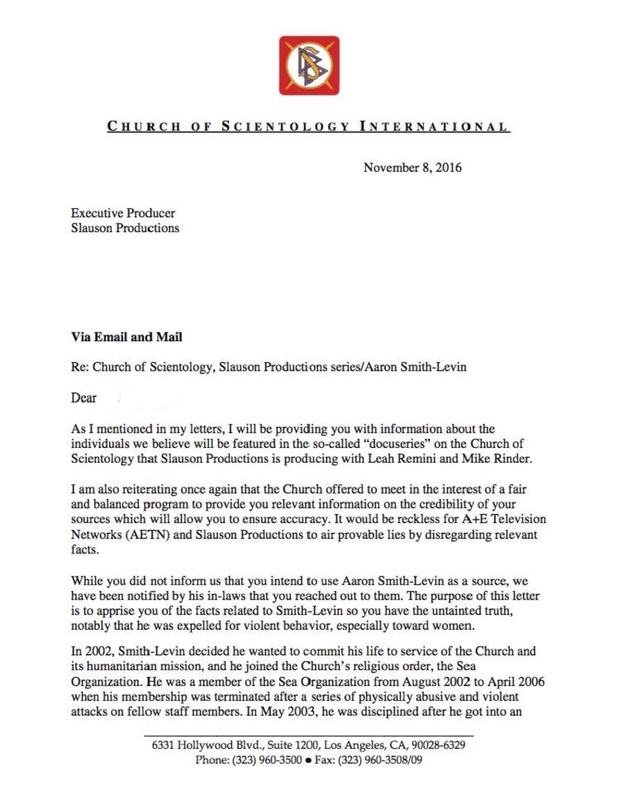 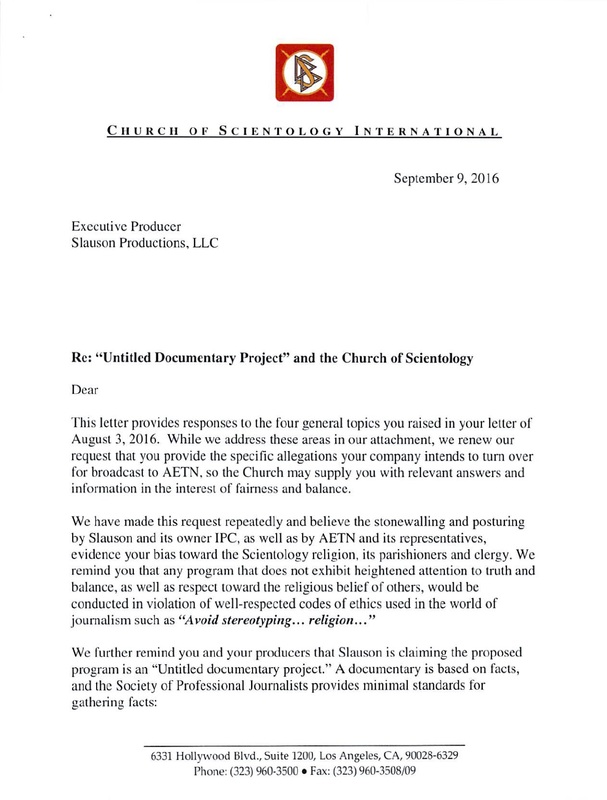 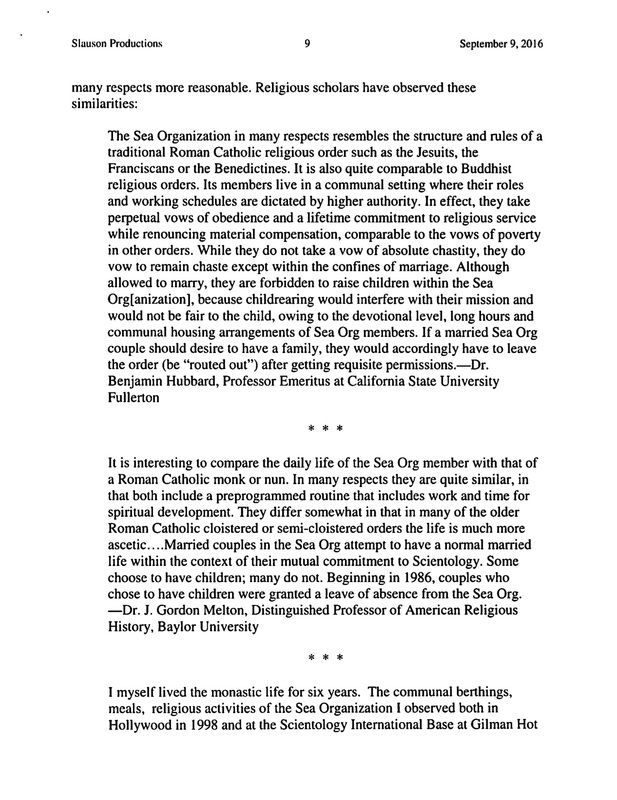 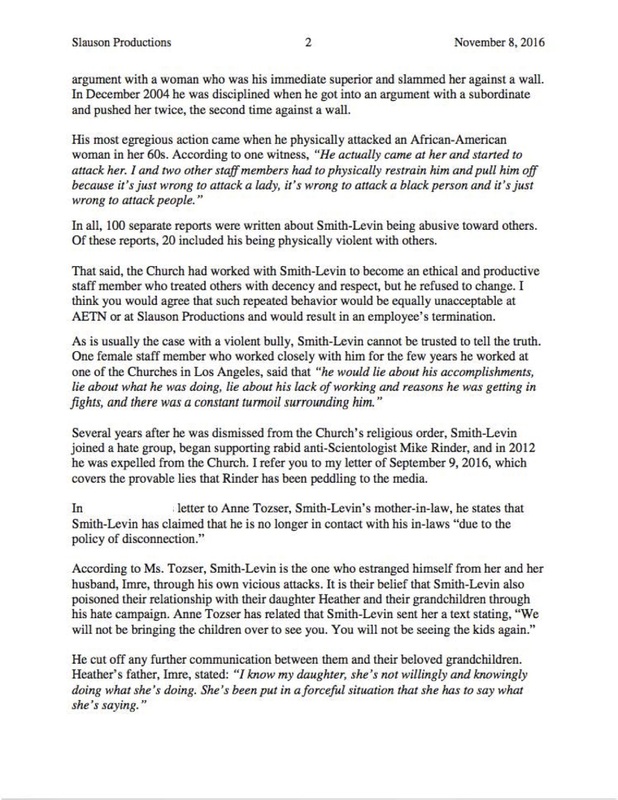 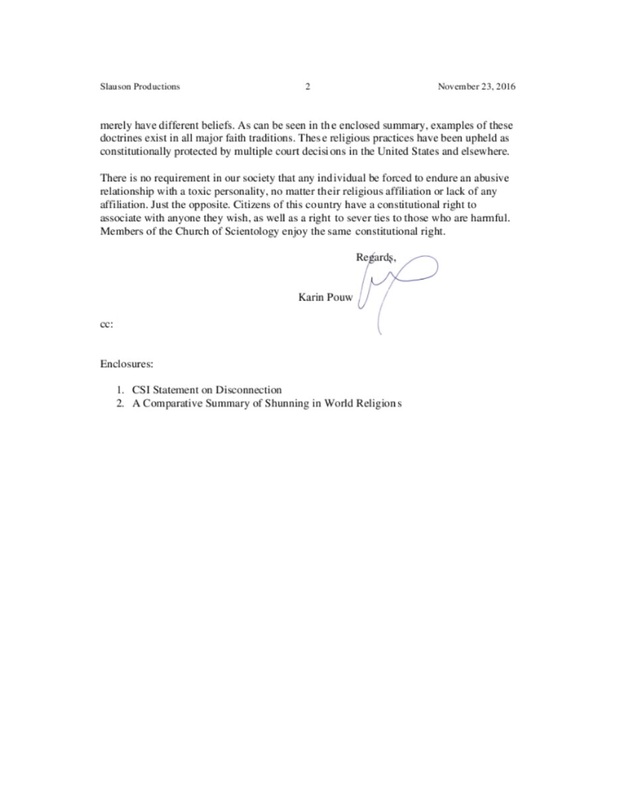 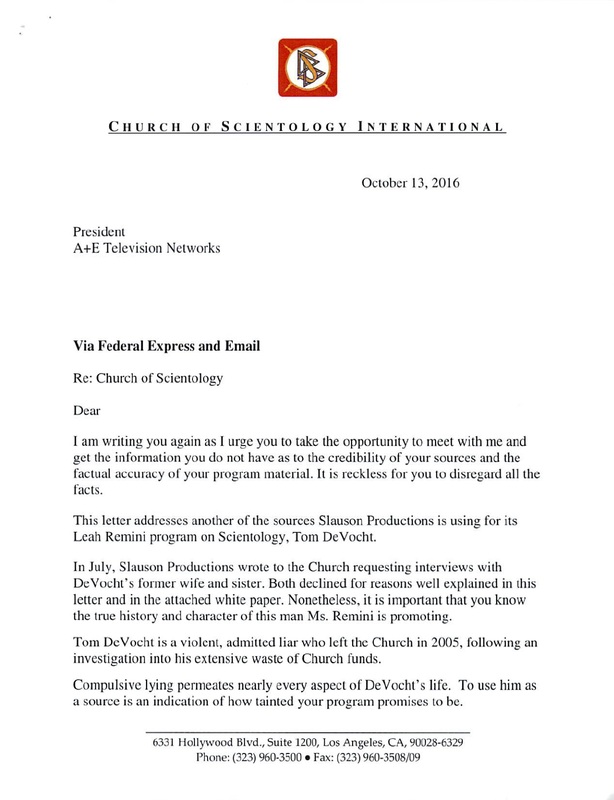 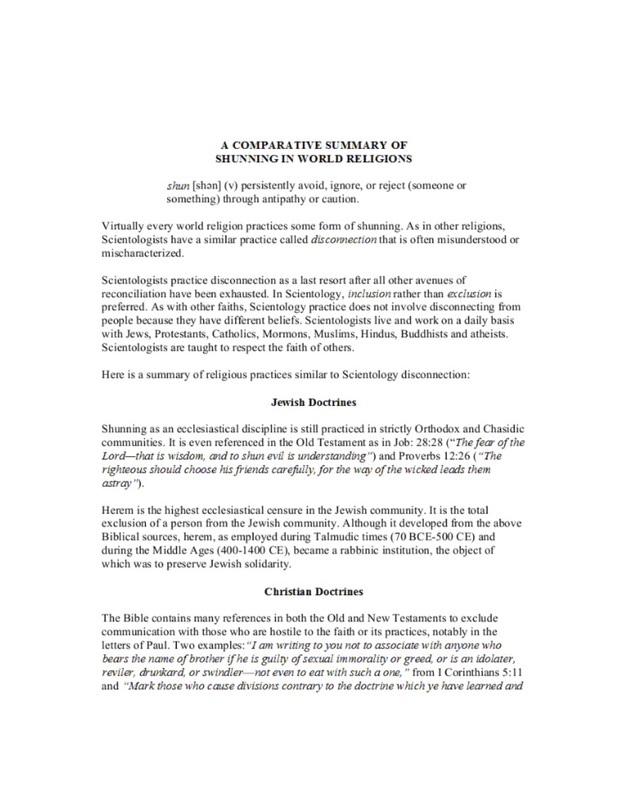 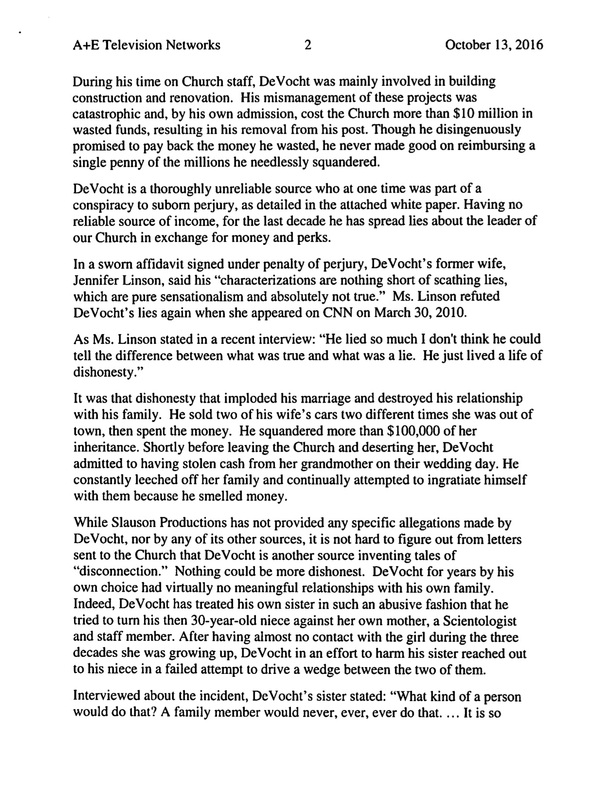 As with other letters that the production has received from the Church regarding participants in the Series, the Church's letter seeks to discredit Mr. Smith-Levin. 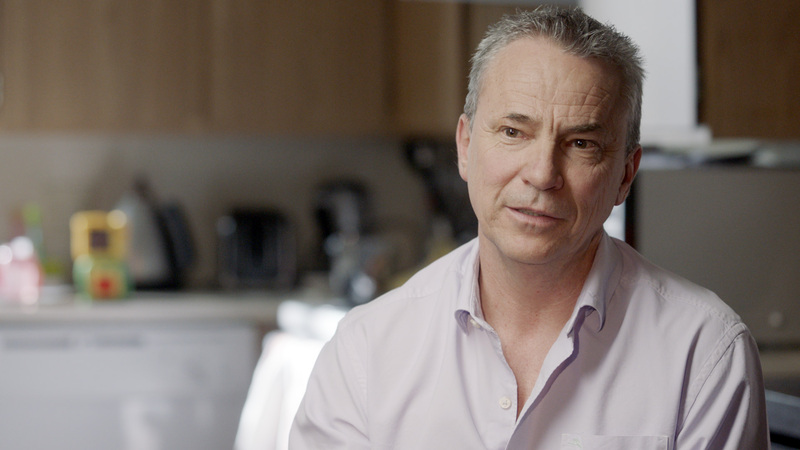 The fifth episode of "Aftermath" focuses on former Sea Organization members Marc and Claire Headley. 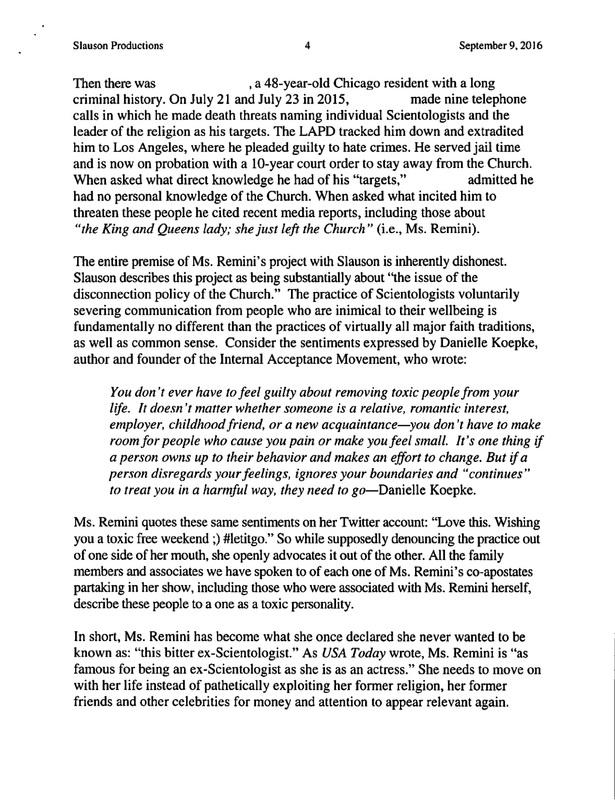 It recounts their experiences as active members within the Sea Org and their story of how they ultimately left. 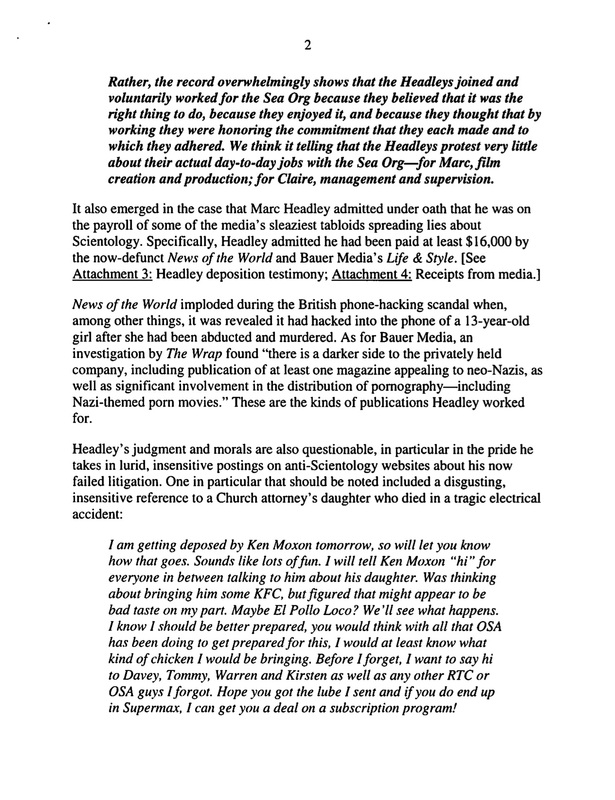 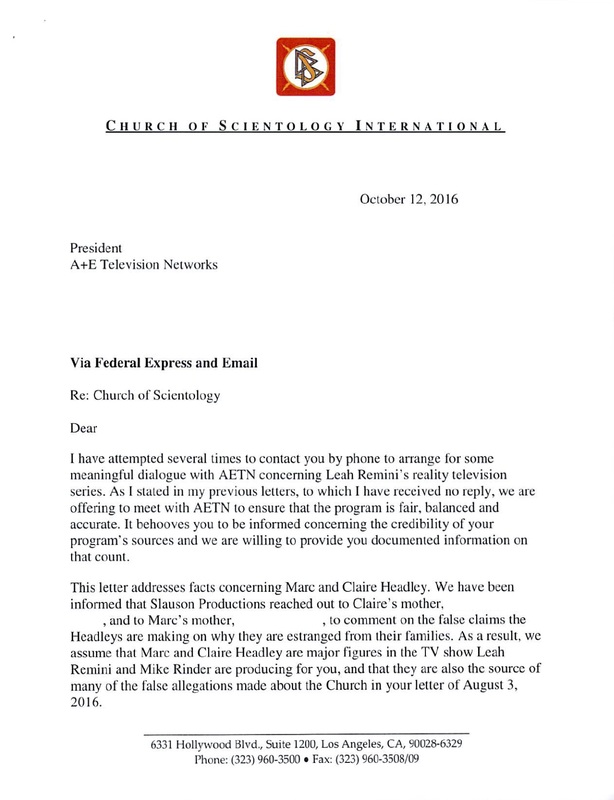 The "Aftermath" production received a letter from the Church about the Headleys, which seeks to undermine the credibility of both Marc and Claire. 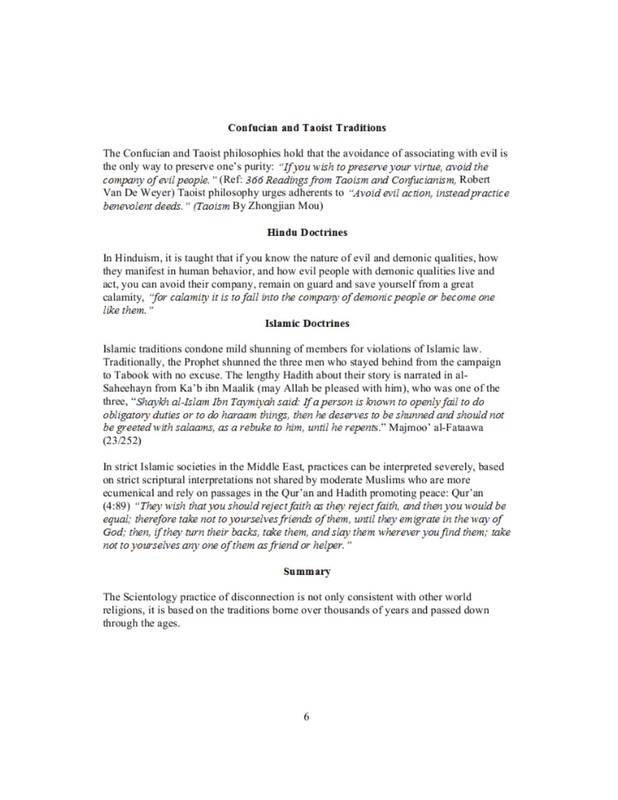 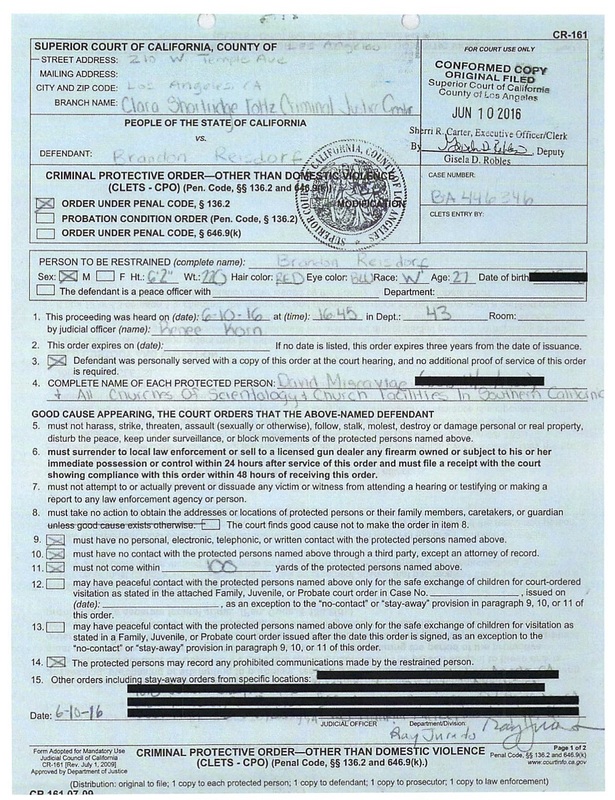 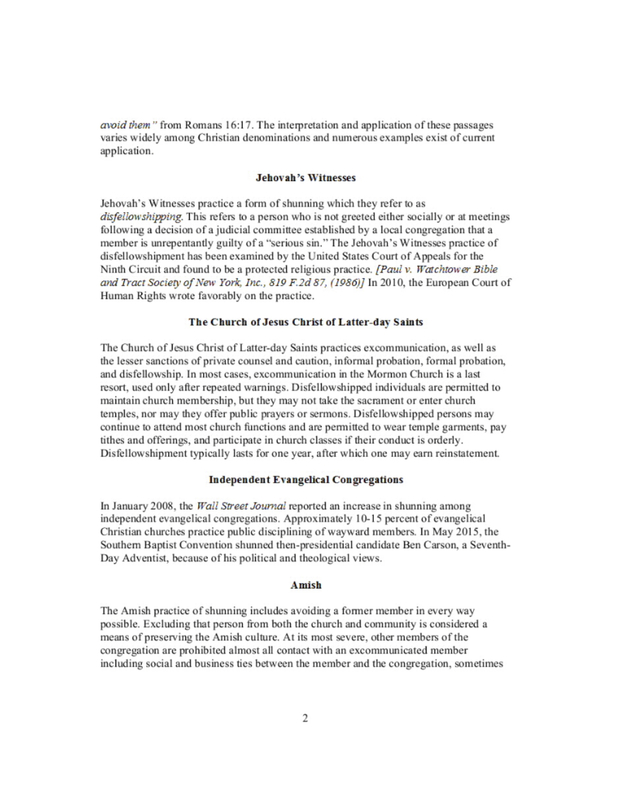 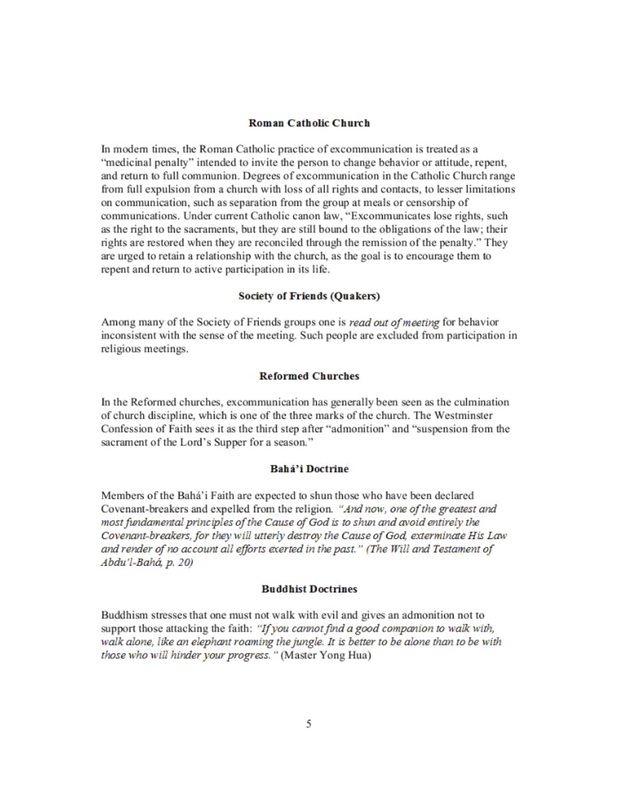 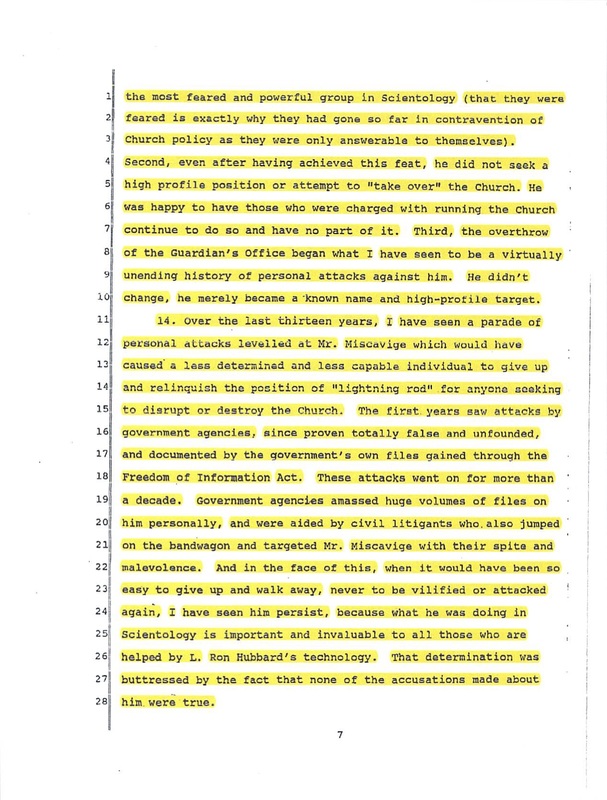 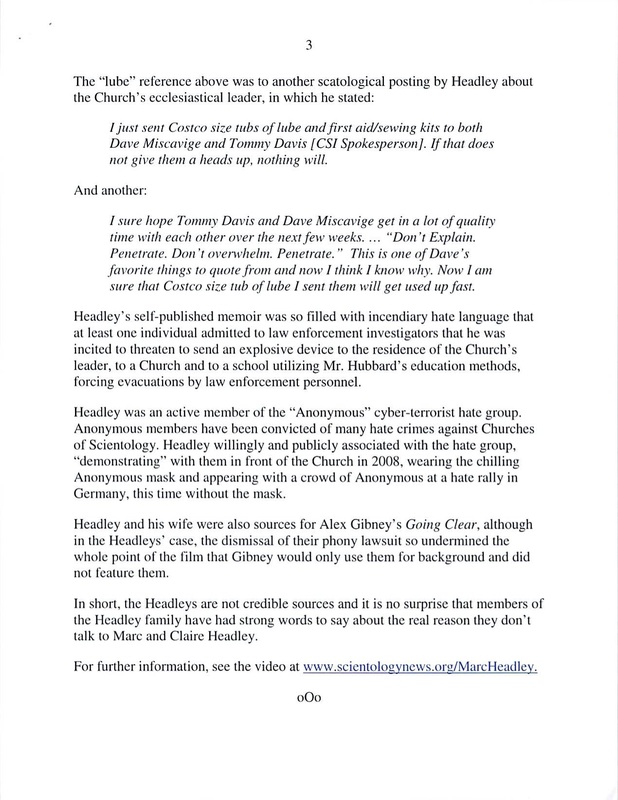 The letter from the Church has been redacted to protect the names of certain individuals, but the highlighting in the accompanying documents is original. 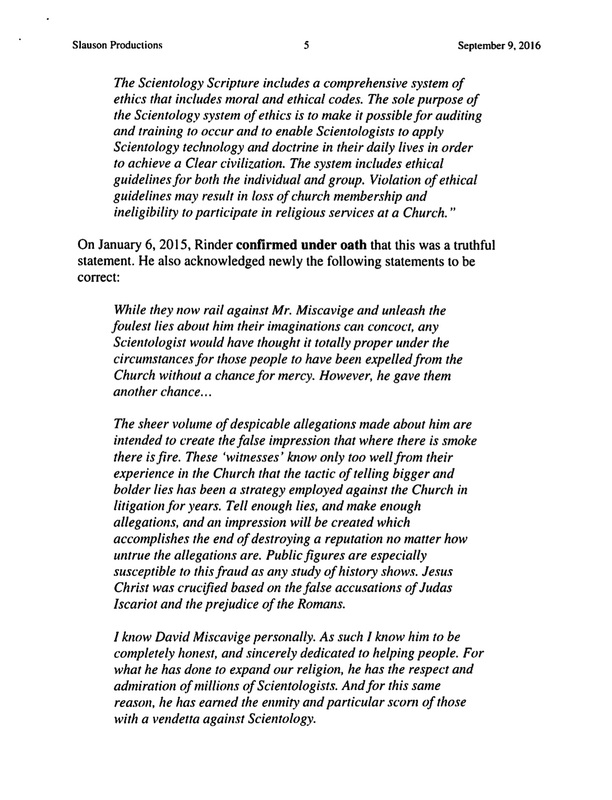 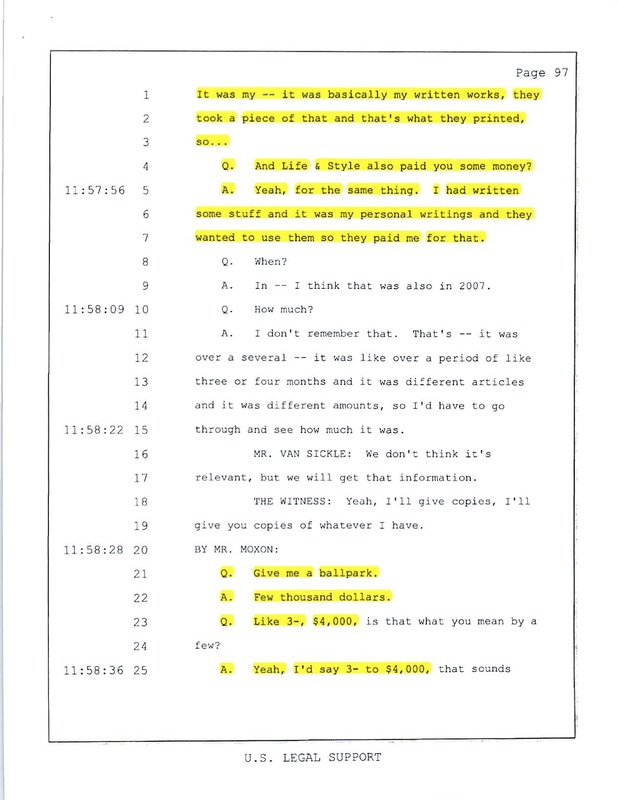 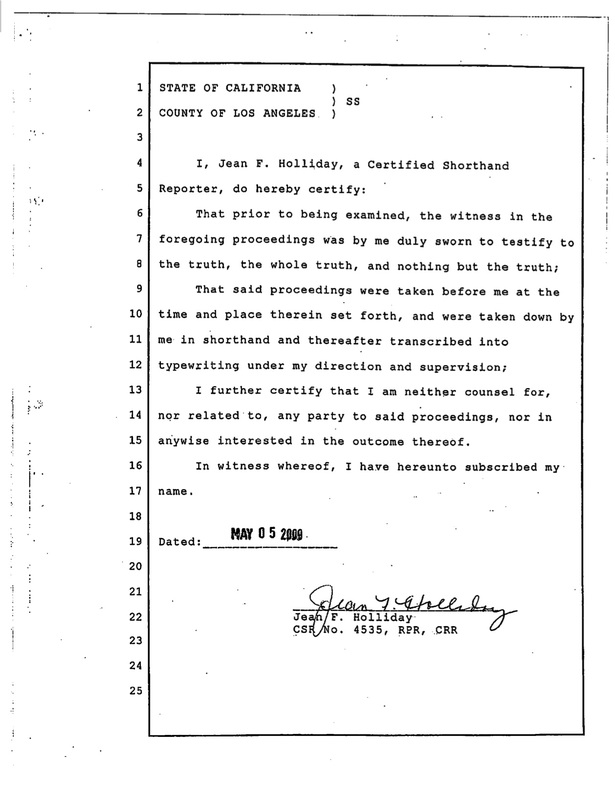 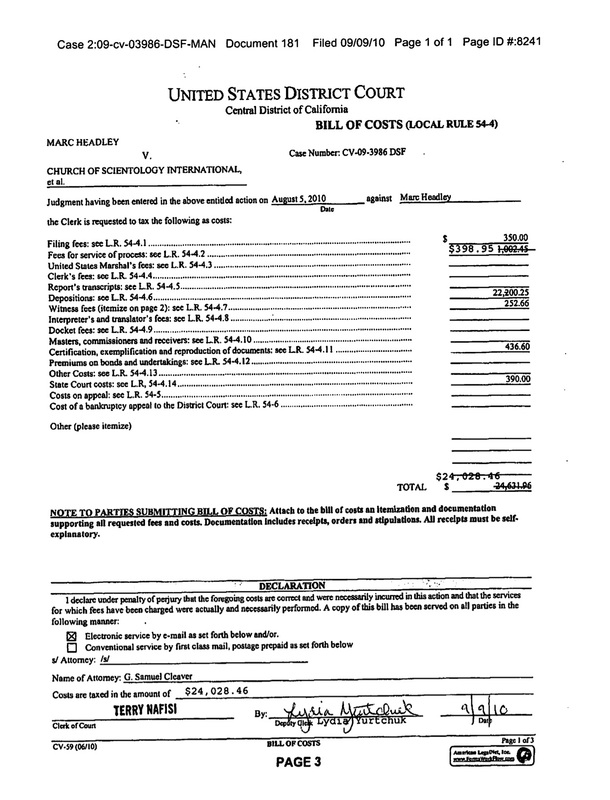 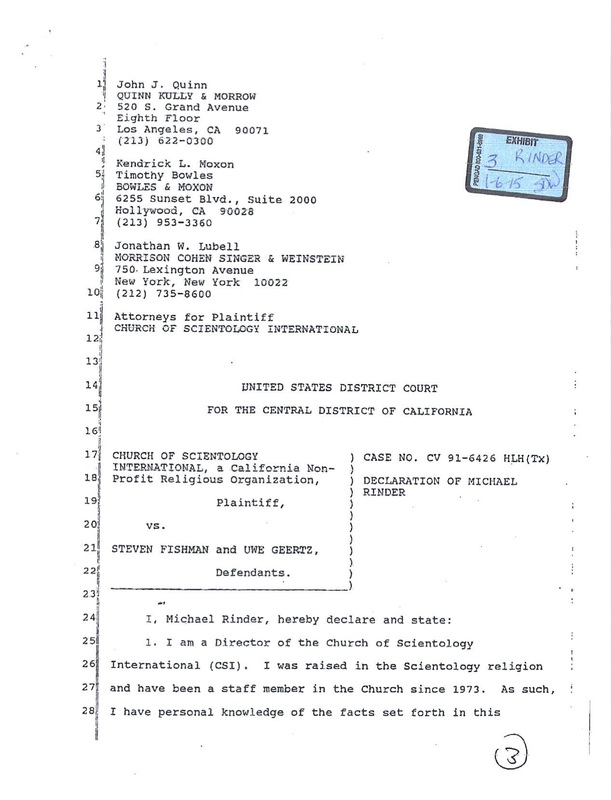 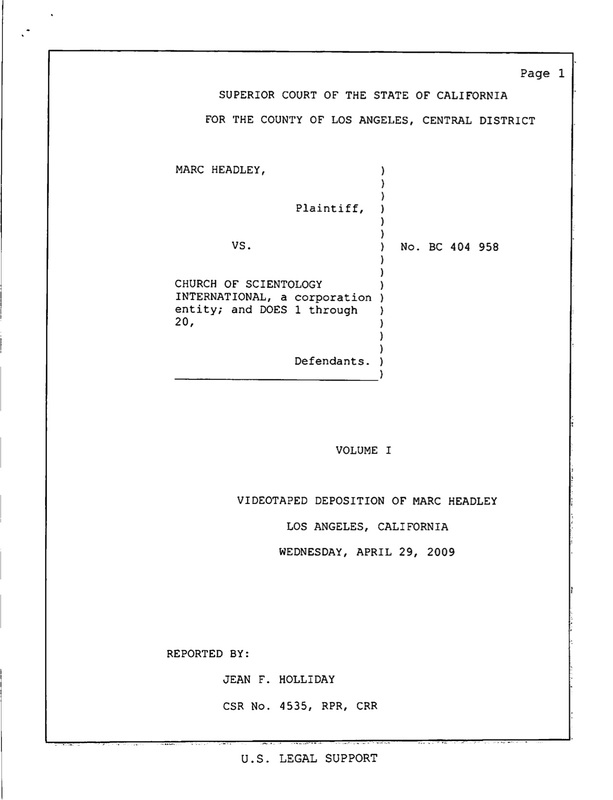 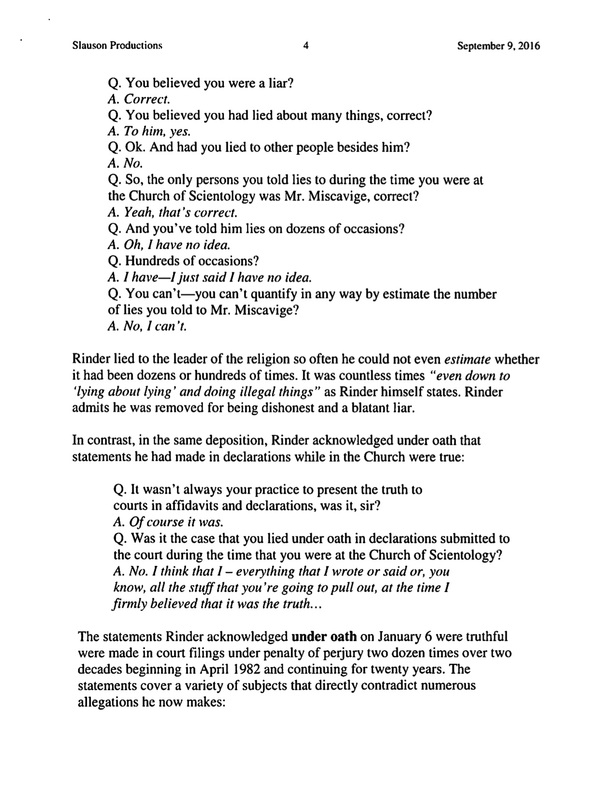 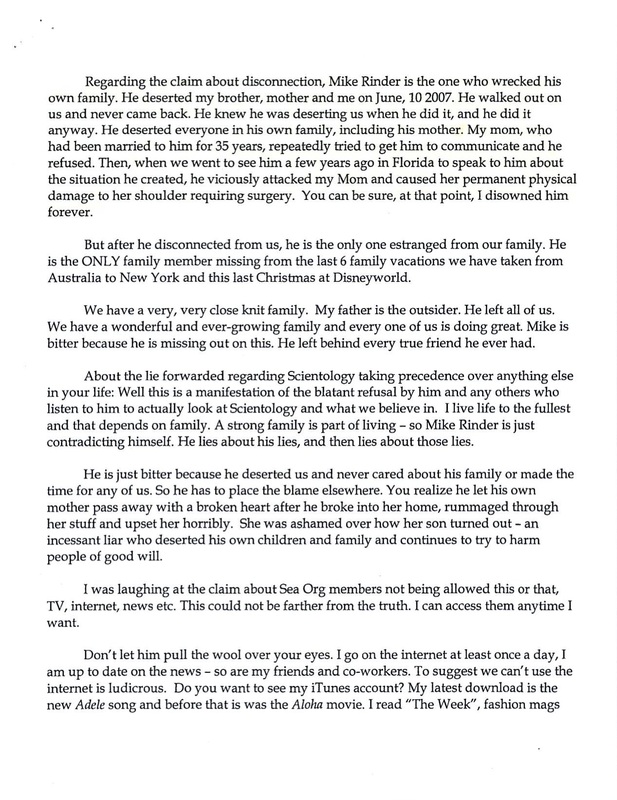 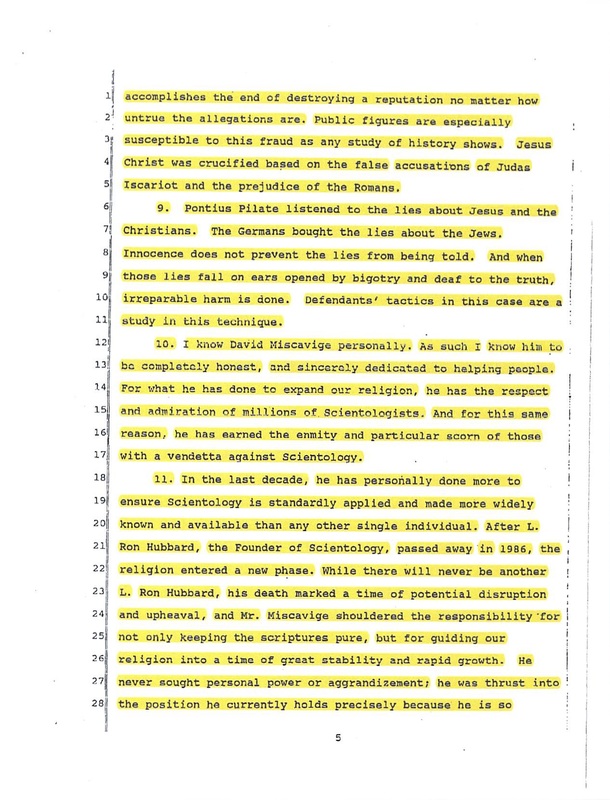 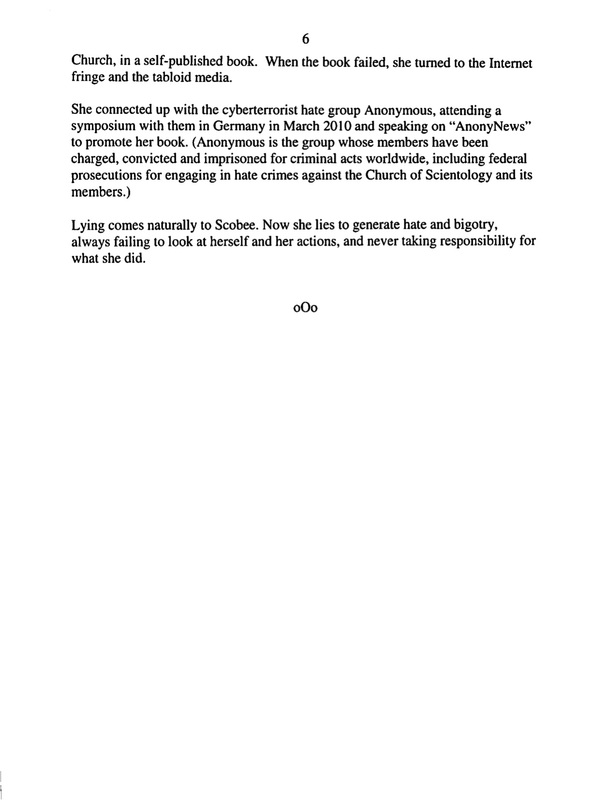 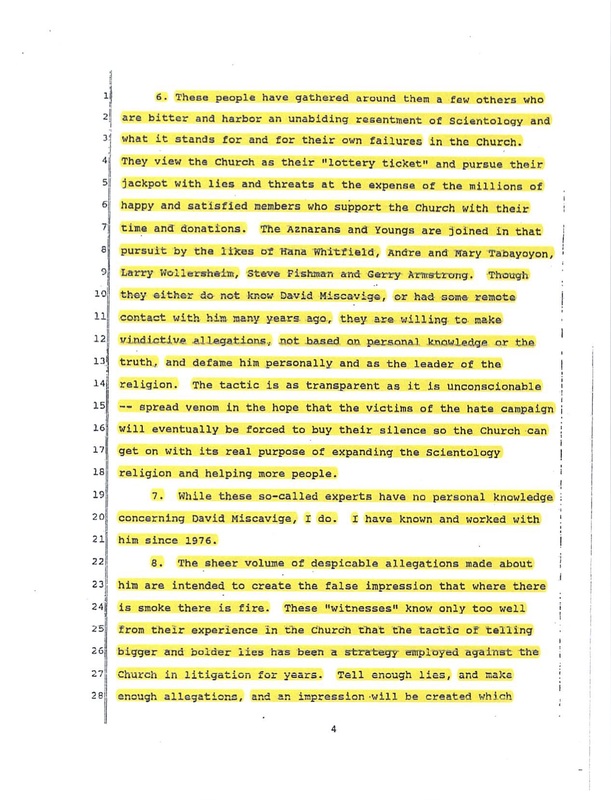 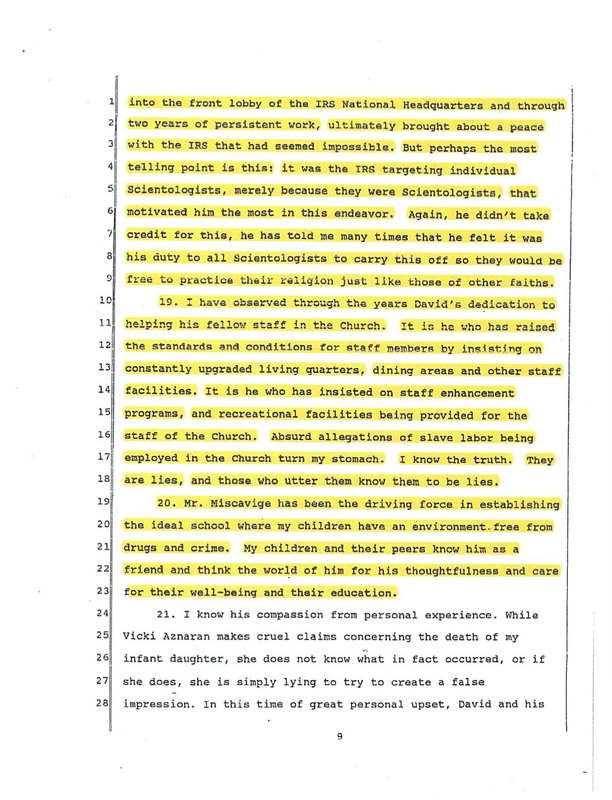 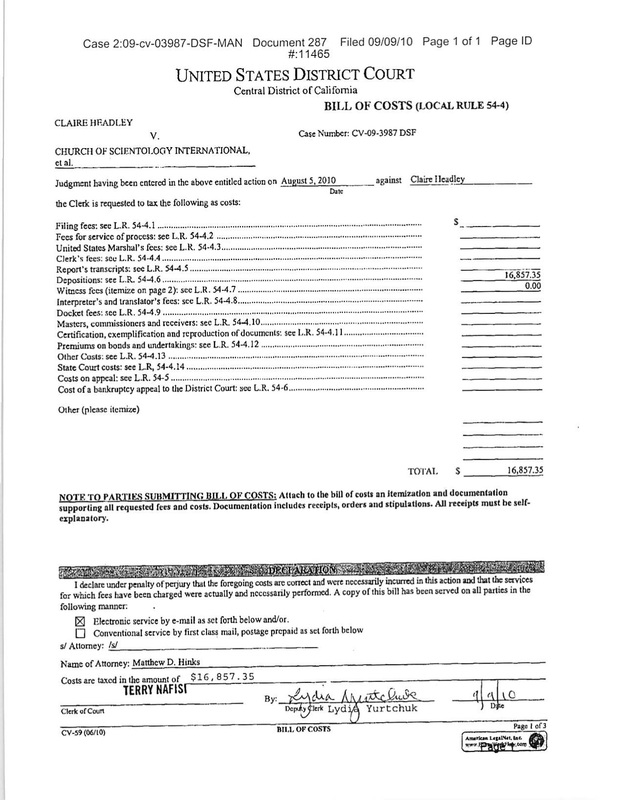 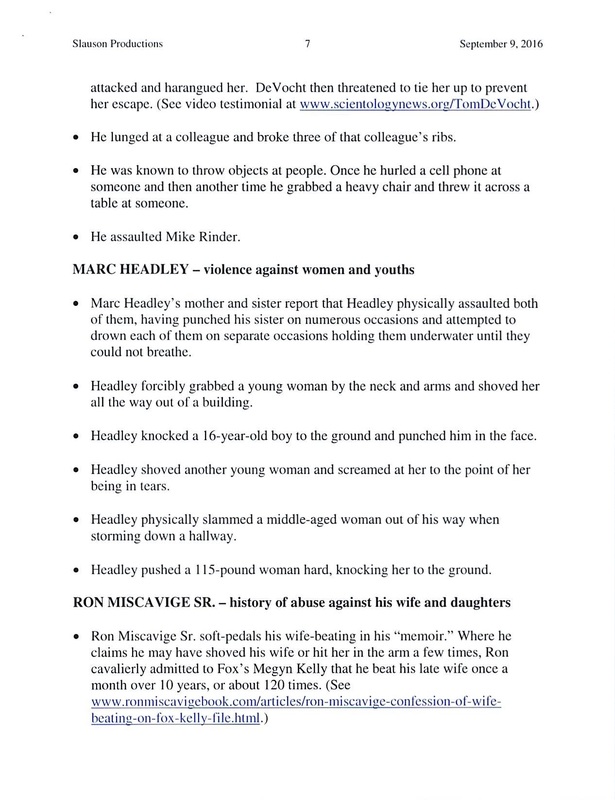 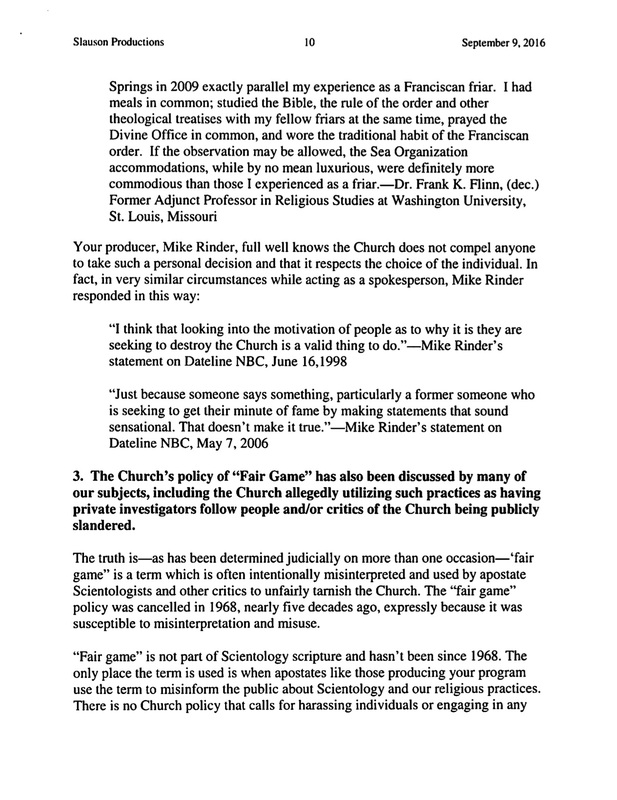 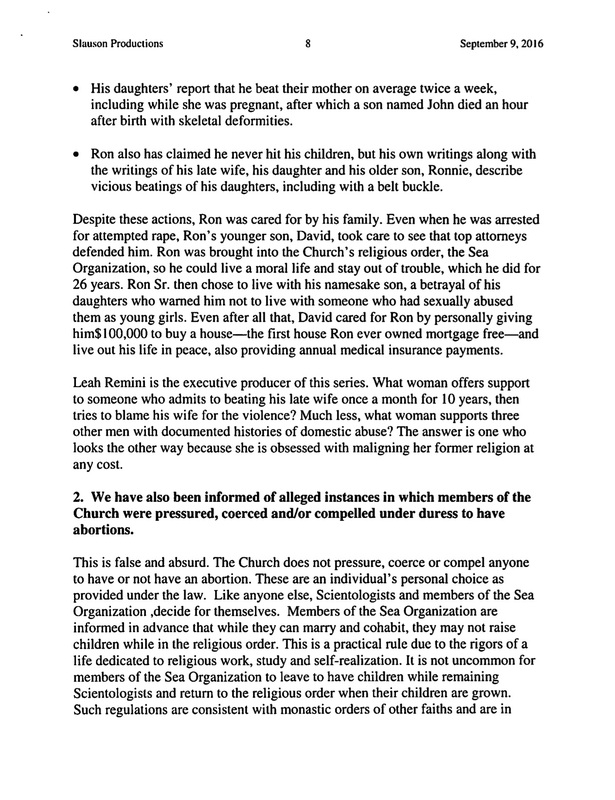 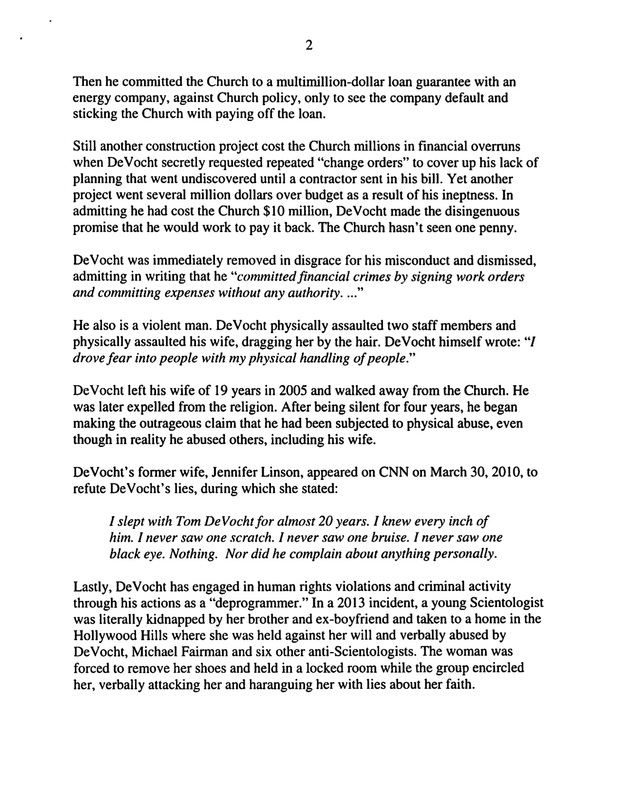 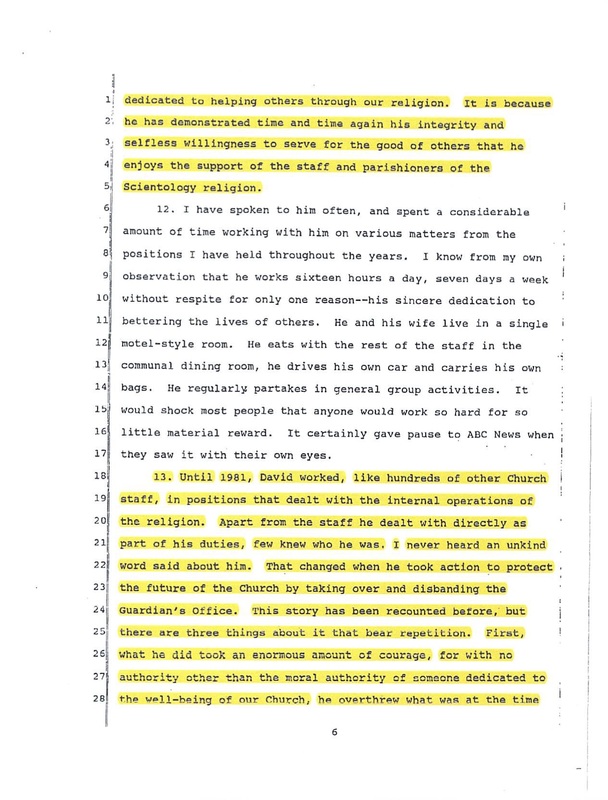 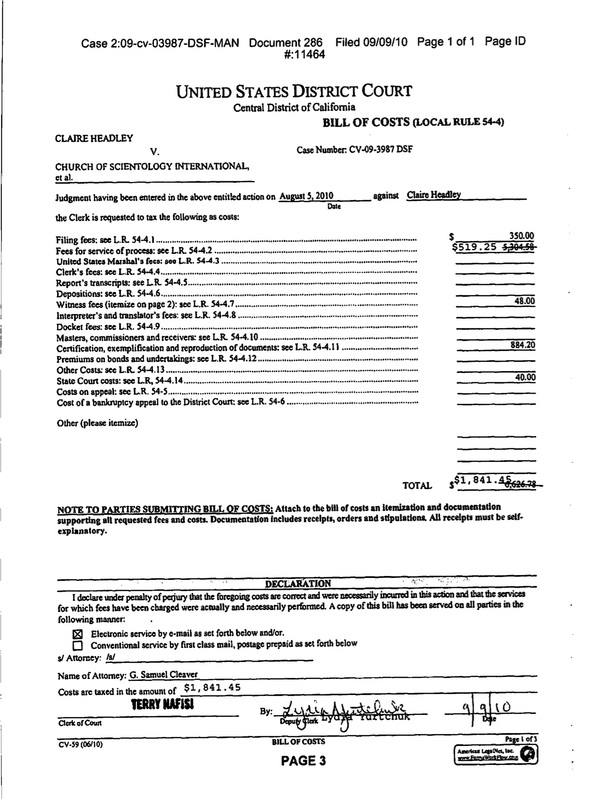 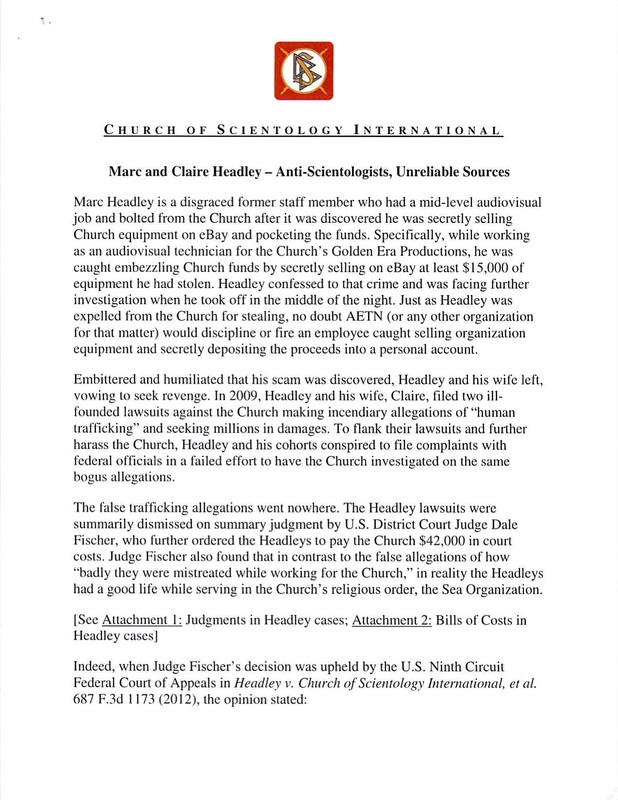 The Church letter along with various attachments, including a CSI White Paper titled "Marc and Claire Headley - Anti-Scientologists, Unreliable Sources," and a selection of documents pertaining to the lawsuit that the Headleys filed against the Church, is below. 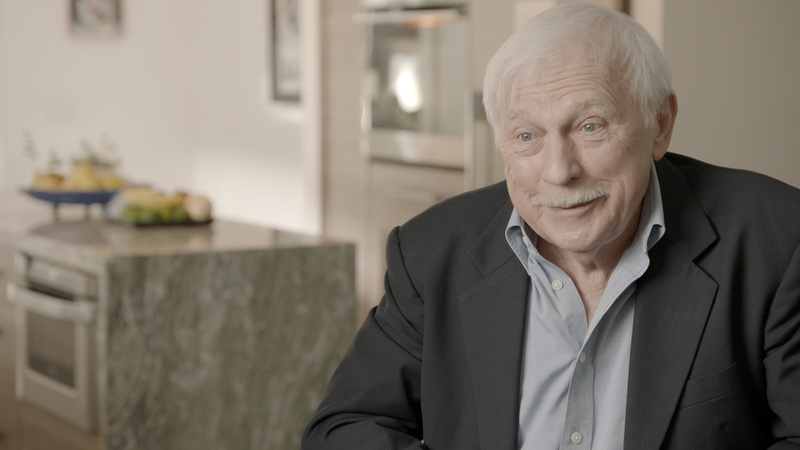 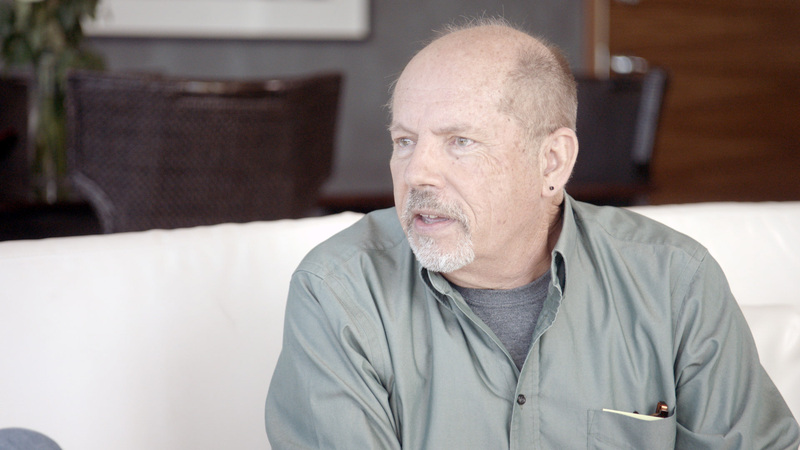 The fourth episode of "Aftermath" examines the experiences of three former members of the Church, Jeff Hawkins, Tom DeVocht, and Ron Miscavige, including their first-person accounts of how they joined the Church, their experiences as Church members, and their subsequent departure from the Church and separation from their family members. 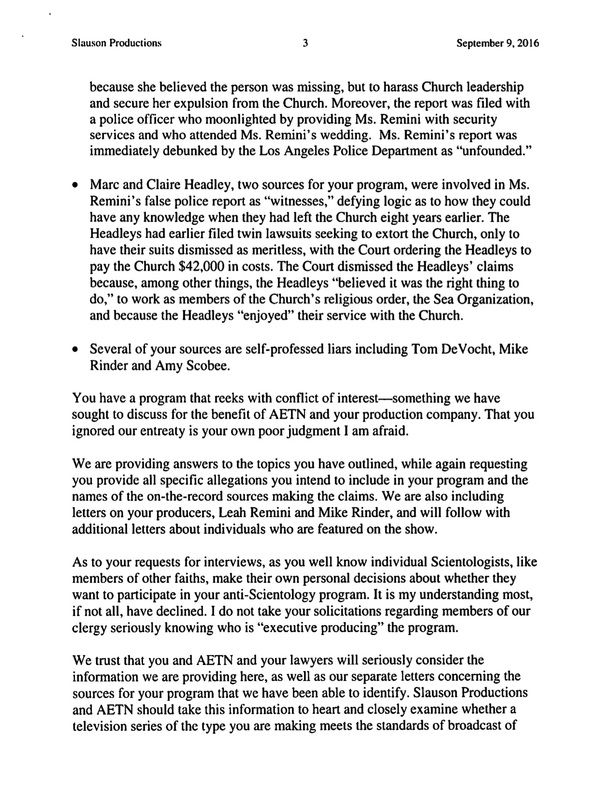 The "Aftermath" production received letters from the Church discrediting each of the participants in the episode. 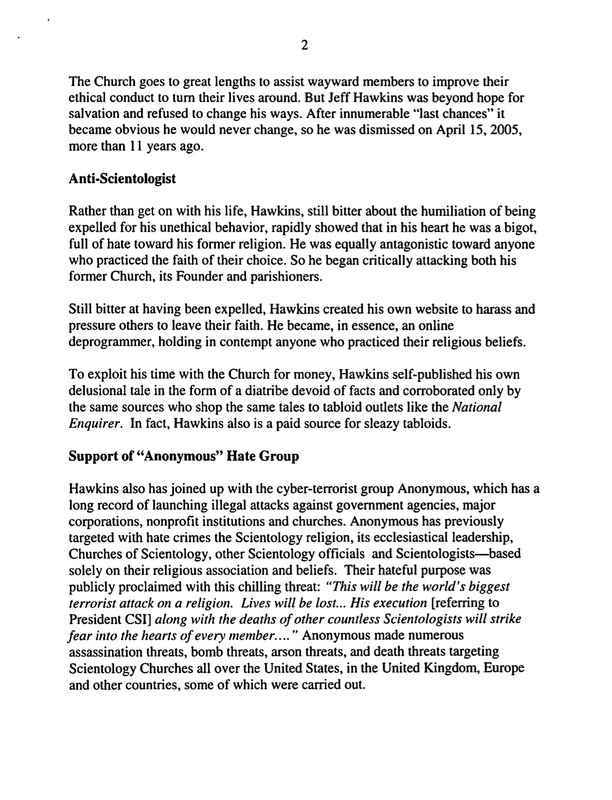 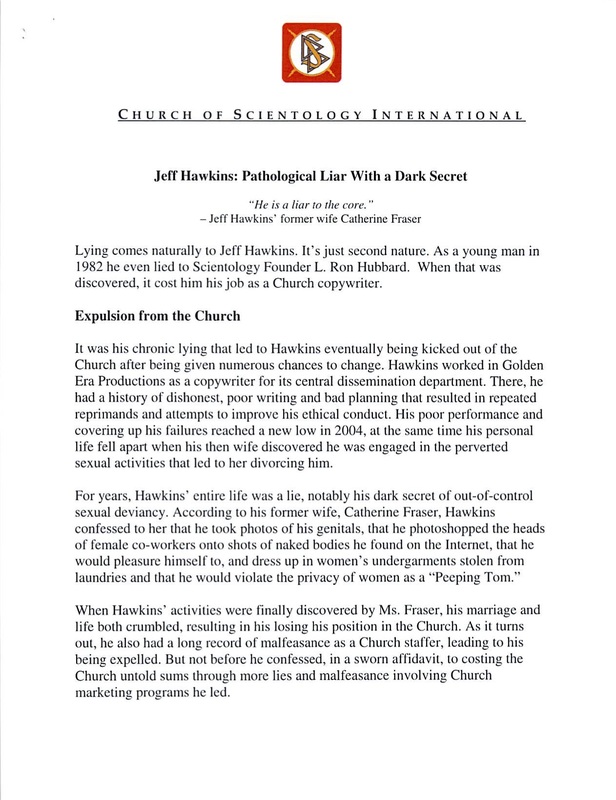 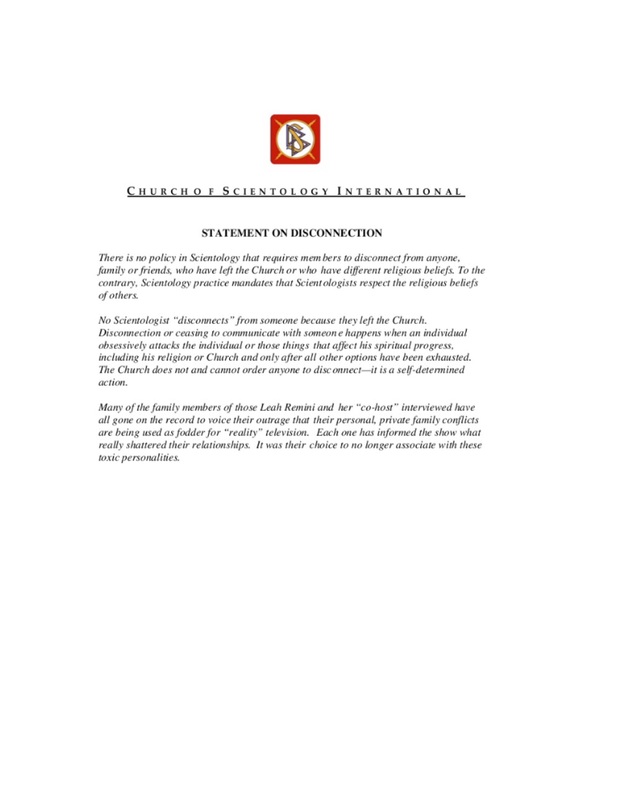 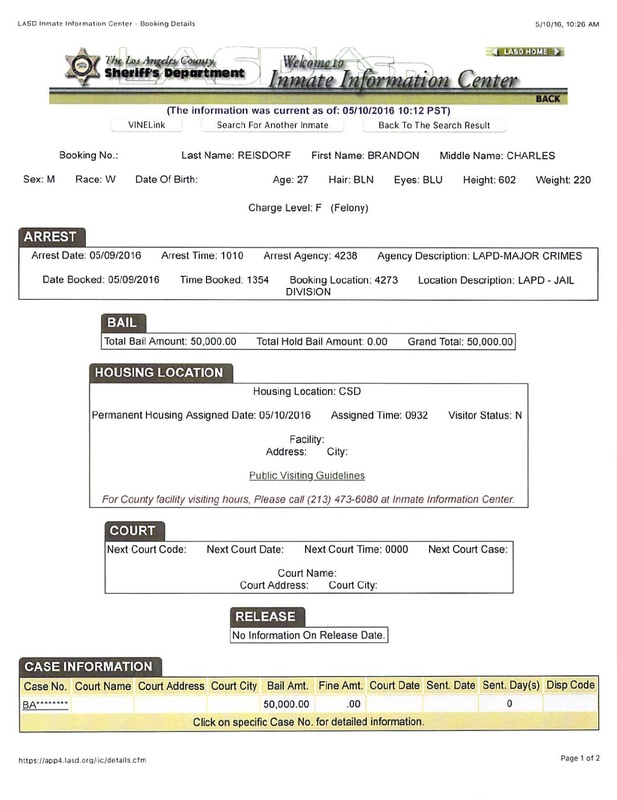 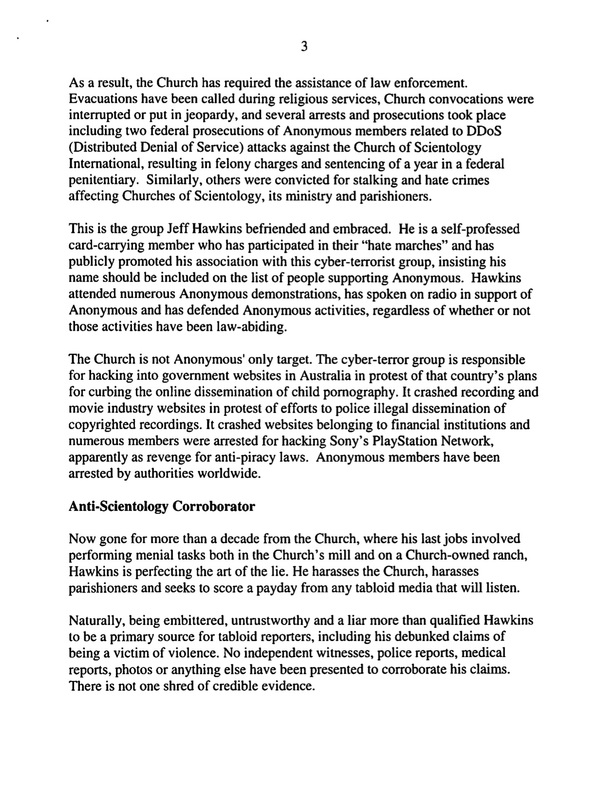 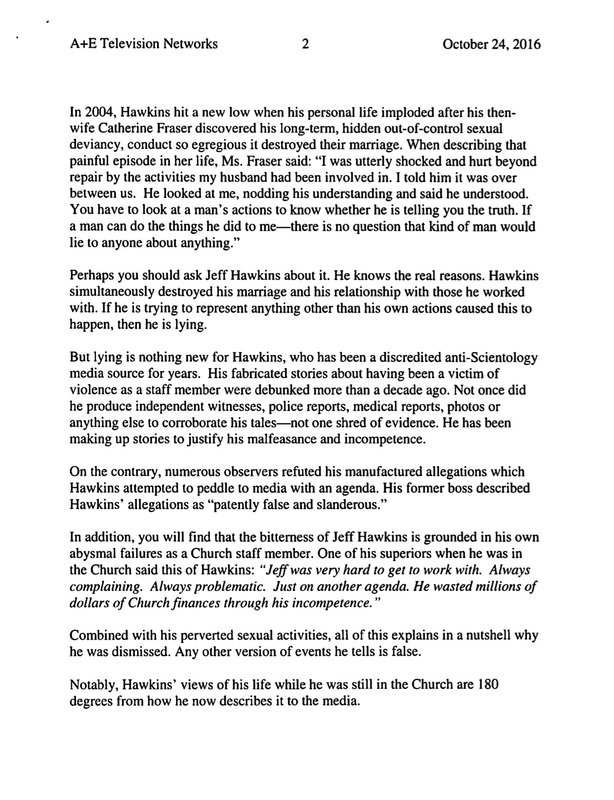 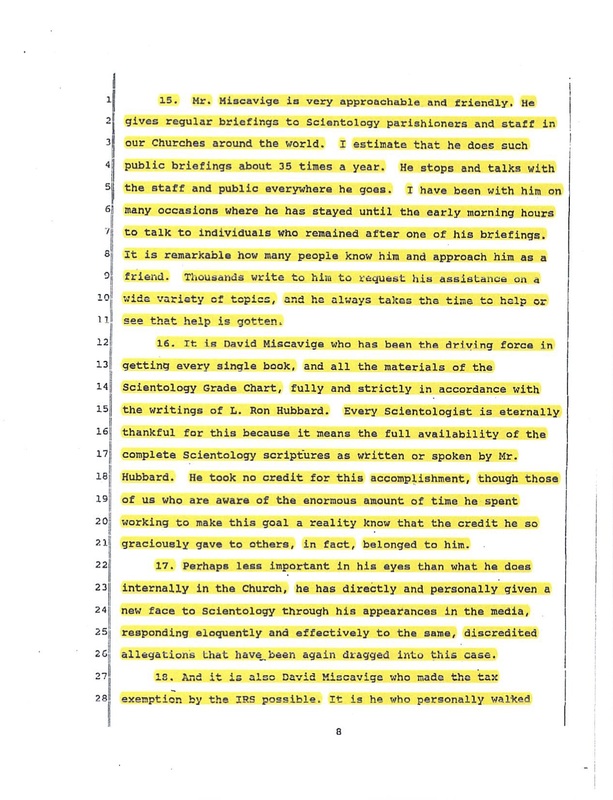 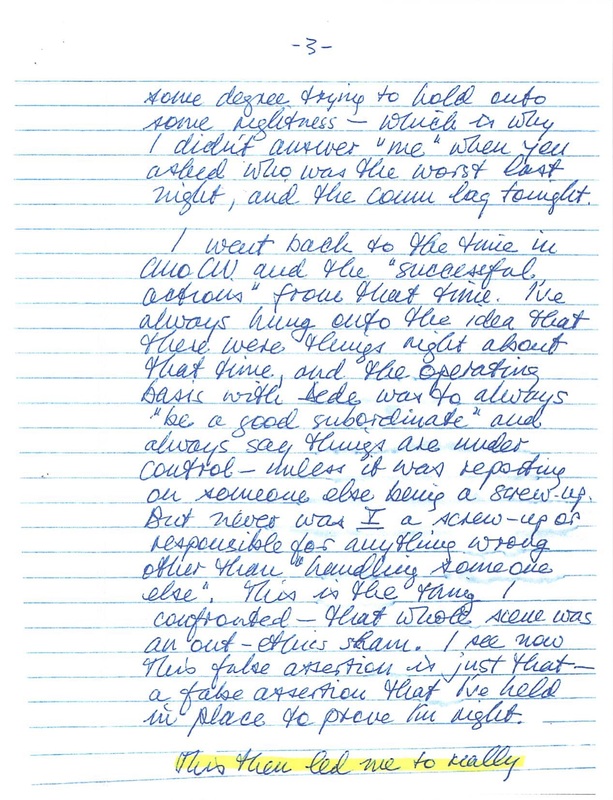 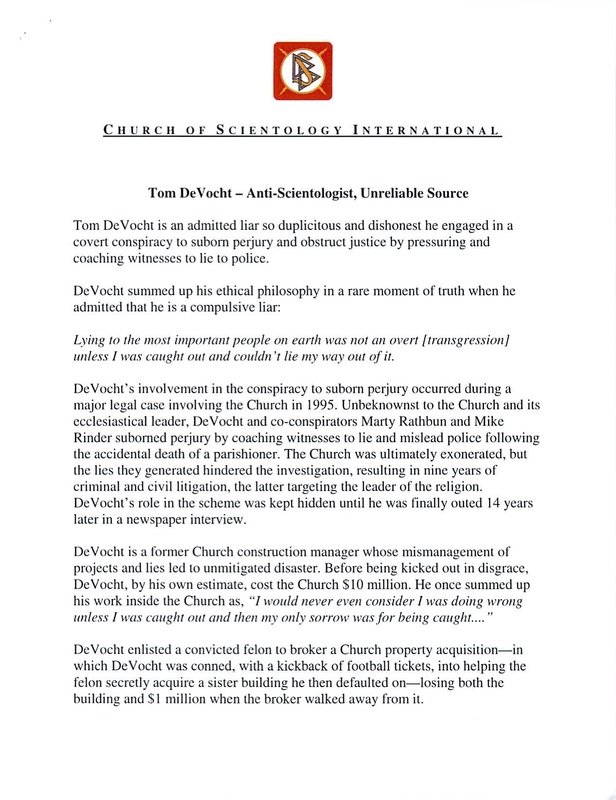 Attached to CSI’s letters regarding Mr. Hawkins and Mr. DeVocht are White Papers prepared by the Church titled "Jeff Hawkins: Pathological Liar With a Dark Secret," and "Tom DeVocht – Anti-Scientologist, Unreliable Source." 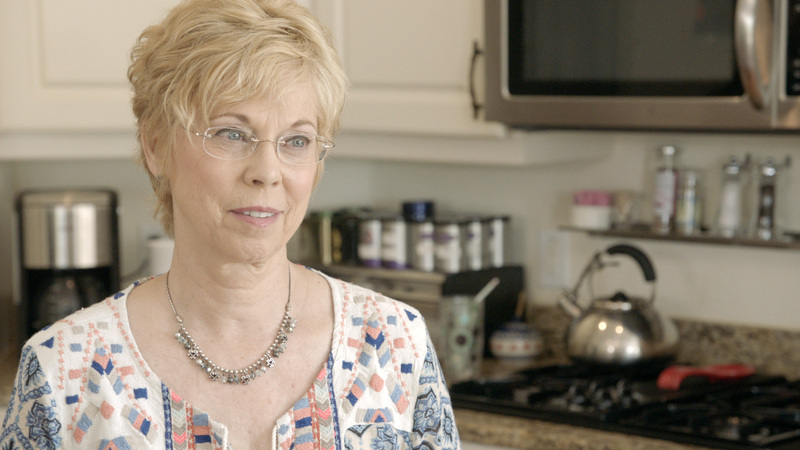 The third episode of "Aftermath" focuses on Mary Kahn's departure and the disconnection from the Church. 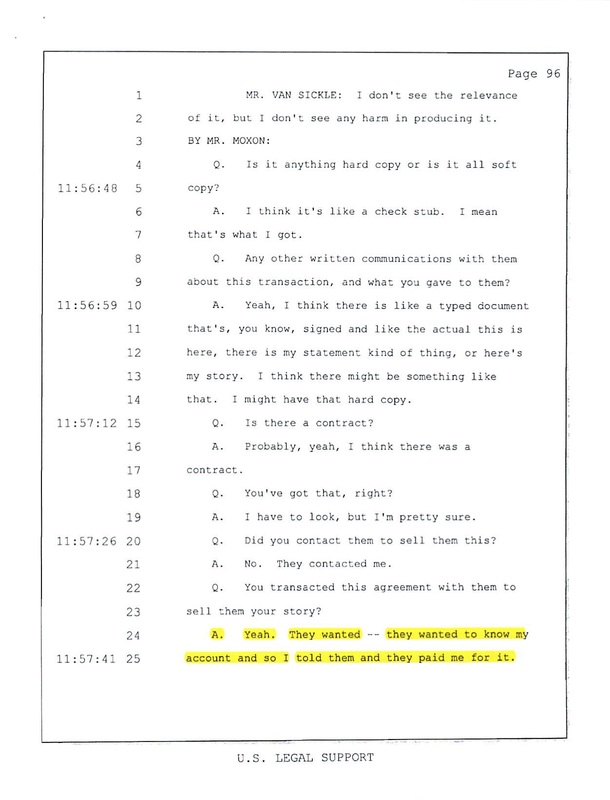 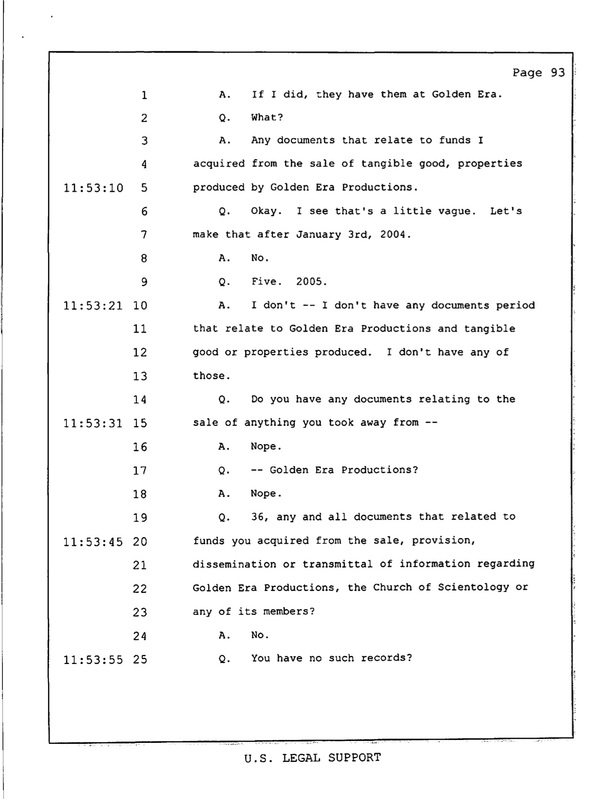 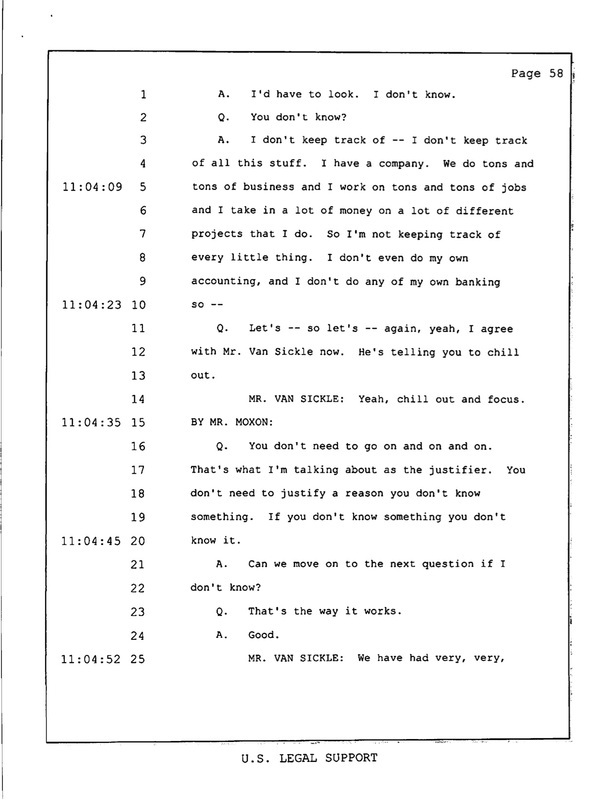 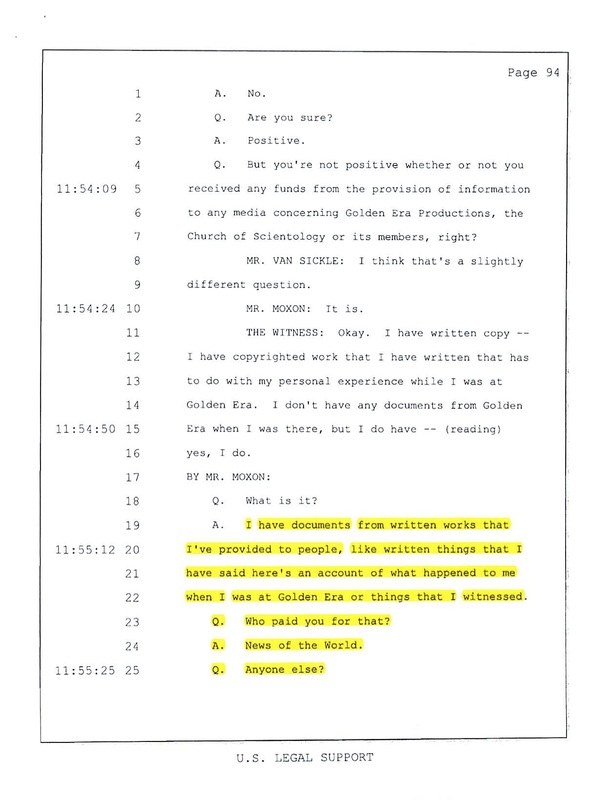 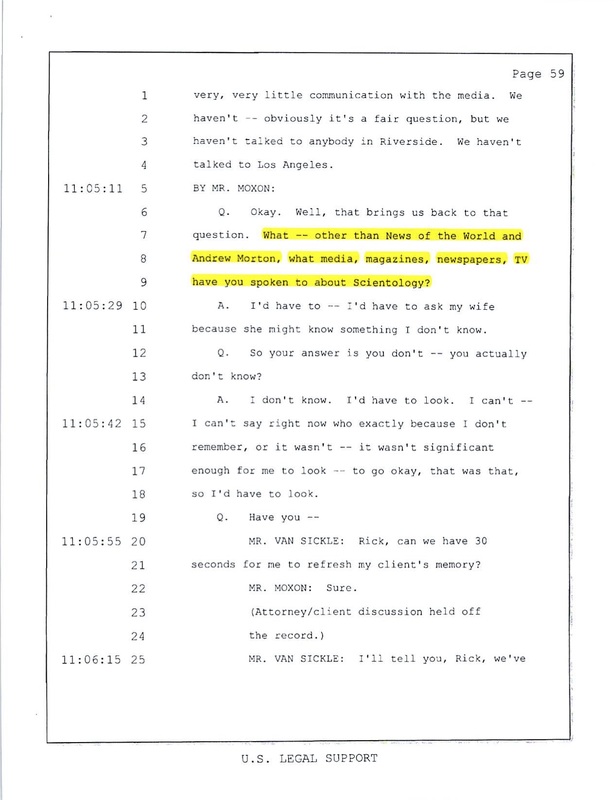 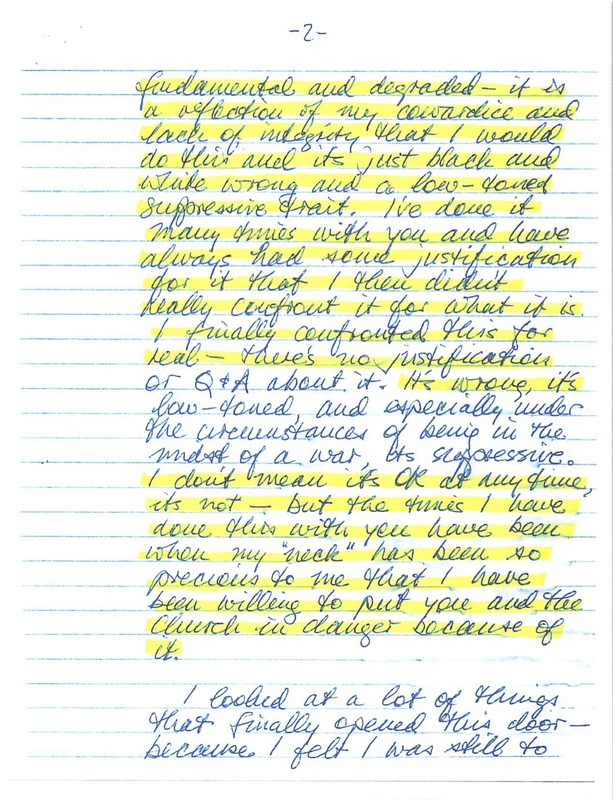 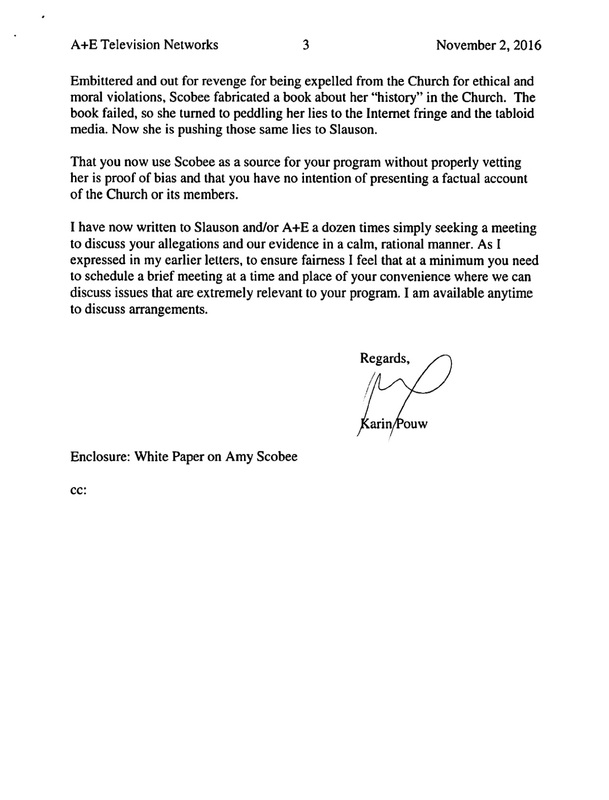 The "Aftermath" production has not received letters from the CSI attempting to discredit Ms. Kahn, but the Church did send two letters addressing certain themes that emerged from the production's interviews with Ms. Kahn and other participants, including the Practice of Disconnection. 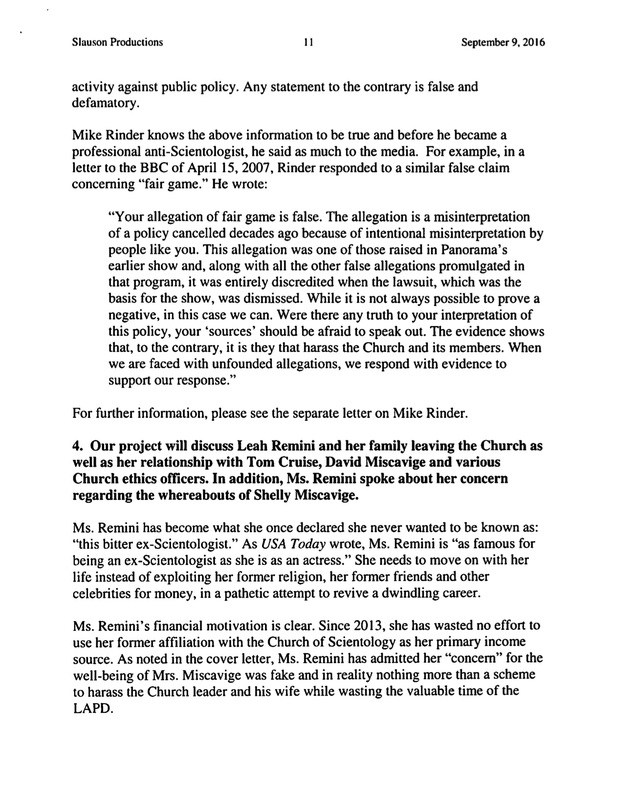 The letters below also contain personal attacks against many of the other participants including Ms. Remini, Mr. Rinder, and others. 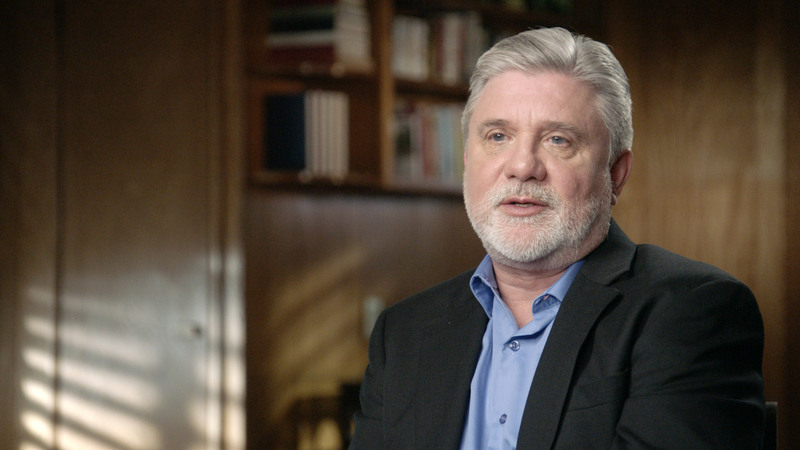 The second episode of "Aftermath" examines former International Spokesperson of CSI Mike Rinder's disconnection from the Church and, as a result, his family. 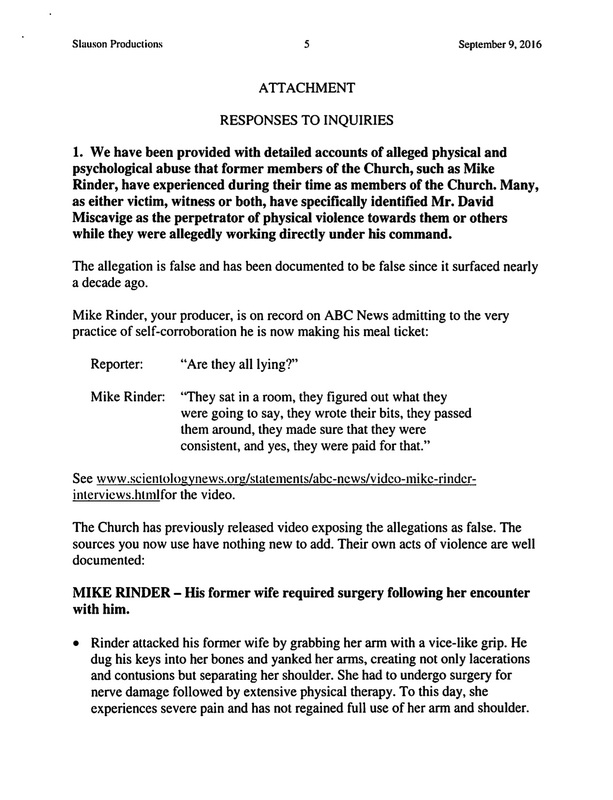 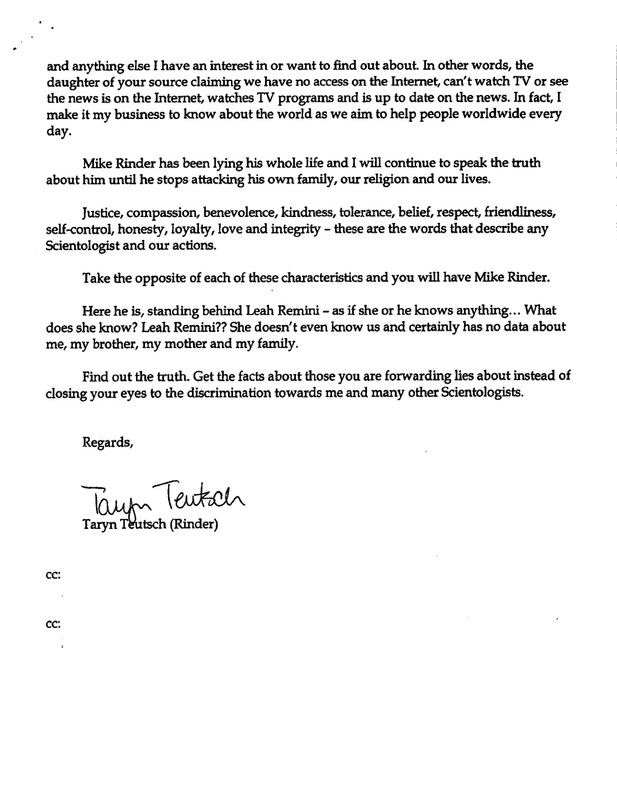 In the lead up to its premier, the "Aftermath" production received letters from both the Church and lawyers for Mr. Rinder's ex-wife and brother assailing Mr. Rinder's character and trustworthiness. 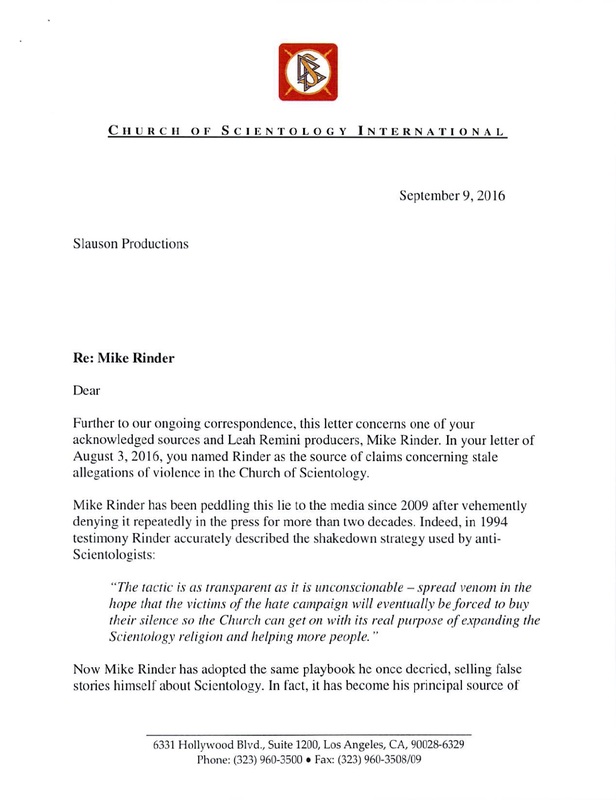 Included with the letter from CSI were various documents that CSI claims further discredit Mr. Rinder. 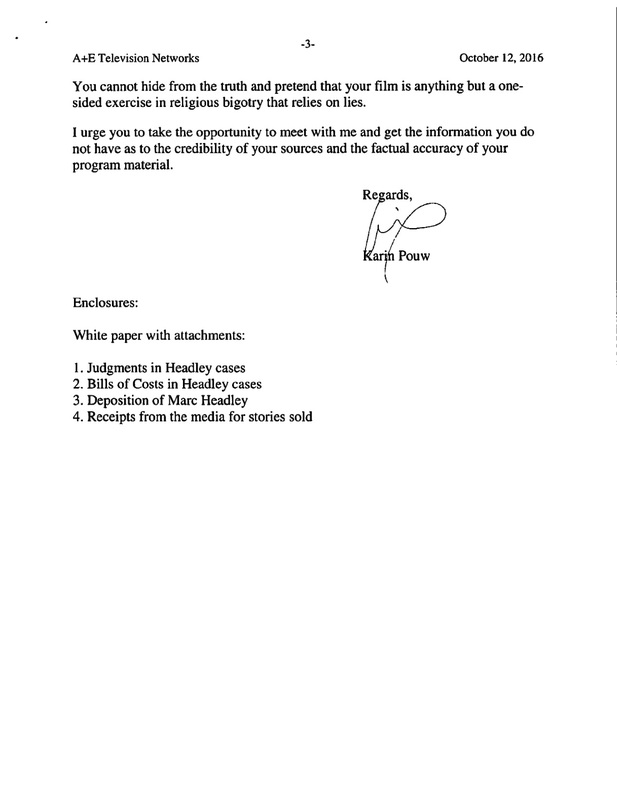 With the exception of his wife's medical records, which we have omitted in the interest of privacy, the letter and the accompanying documents from CSI are included below with original highlighting. 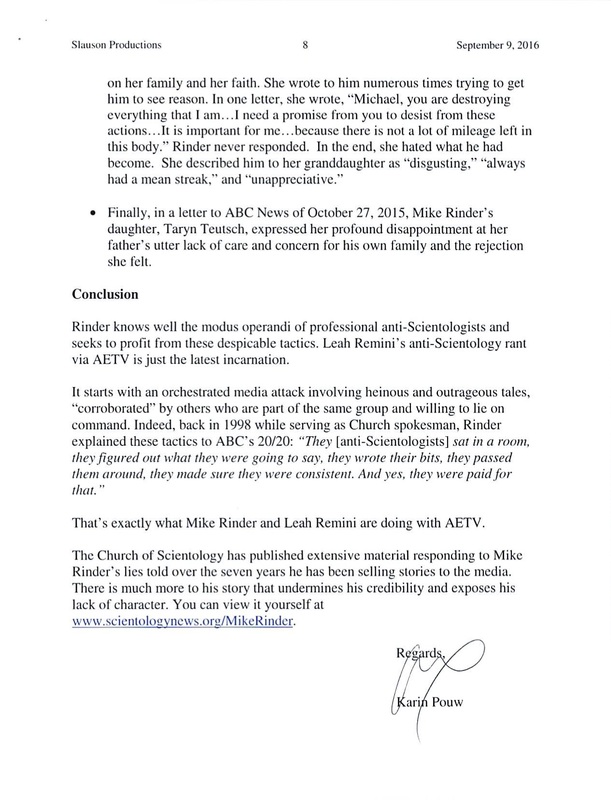 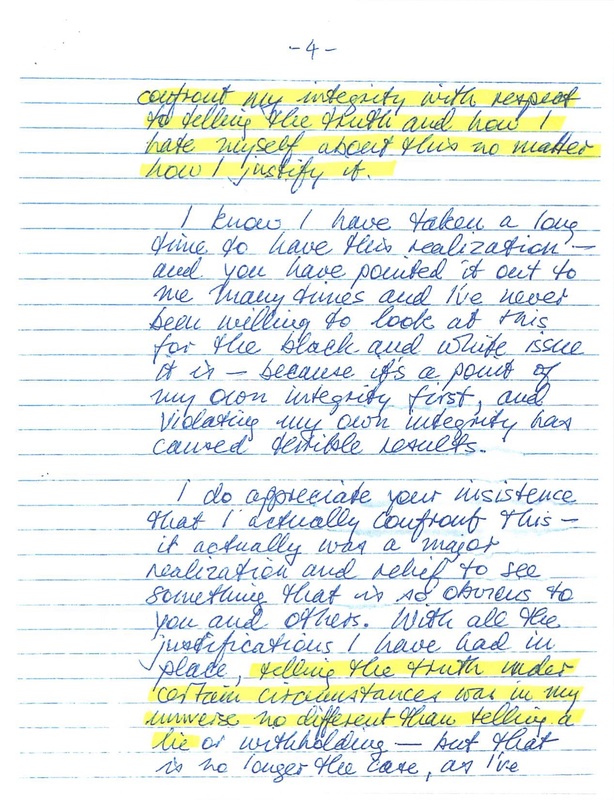 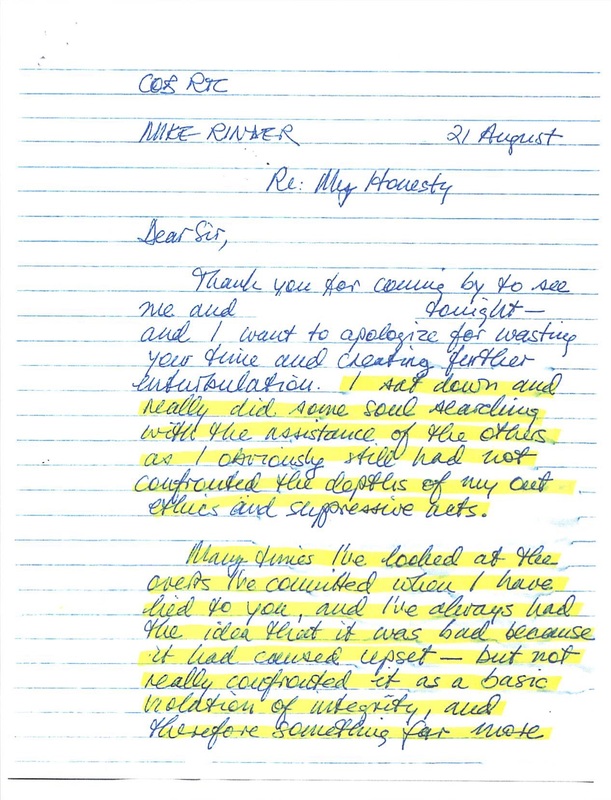 While Mr. Rinder, like Ms. Remini, appears in all eight episodes of the series, we include CSI's letter here because he is the primary focus of this episode. 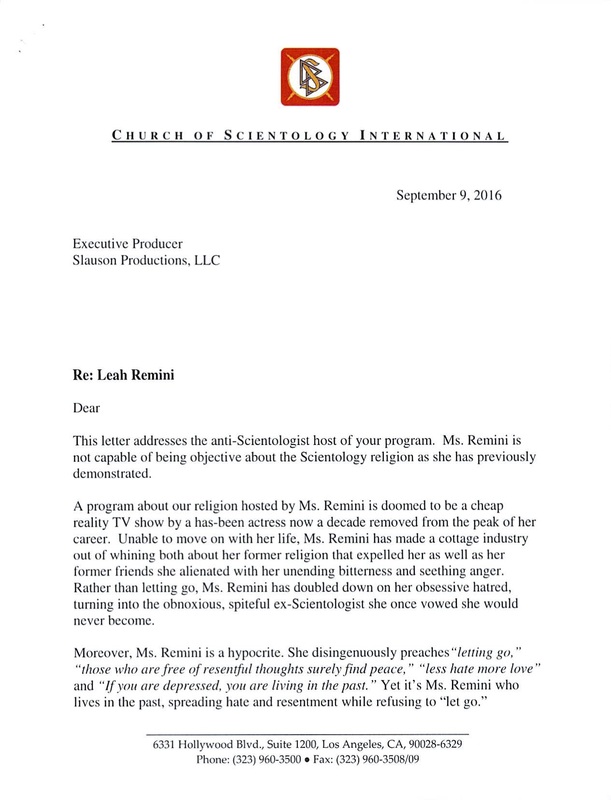 The first episode of "Aftermath" focuses on Leah Remini's and Amy Scobee's experiences within Scientology and departures from the Church. 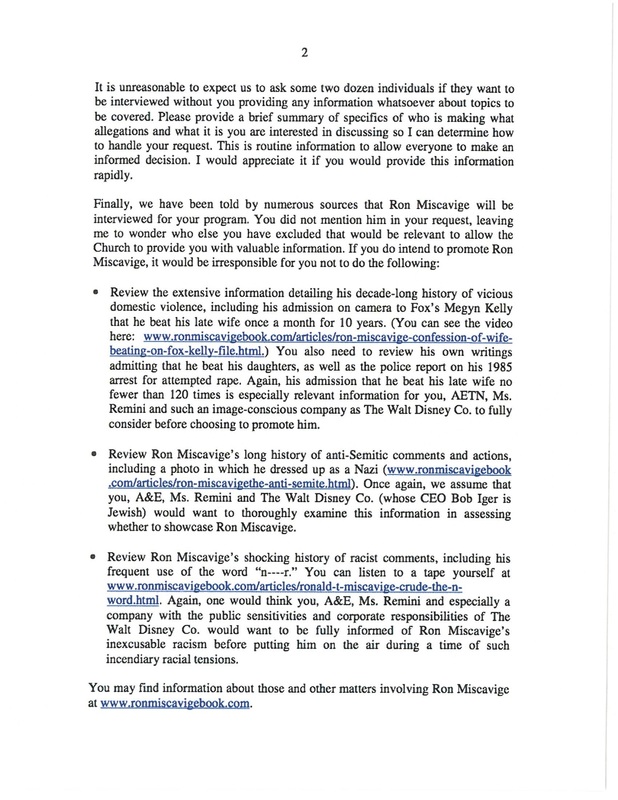 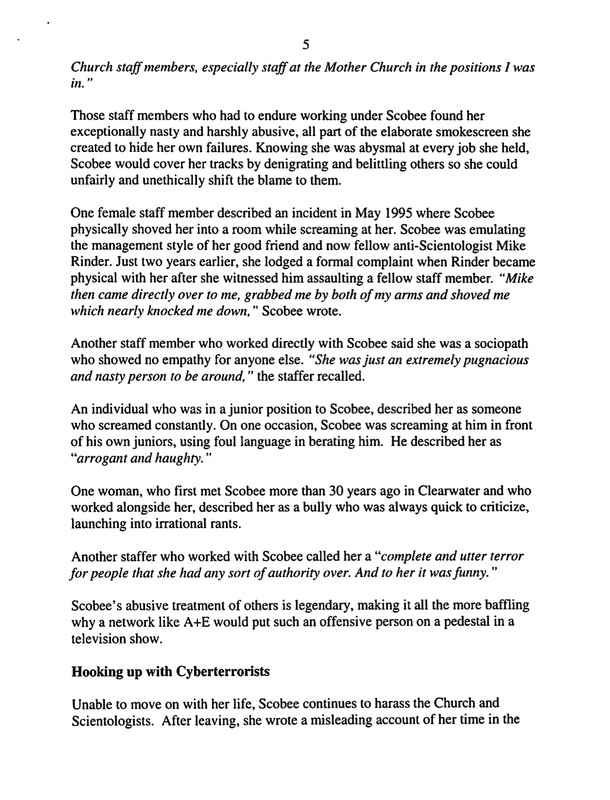 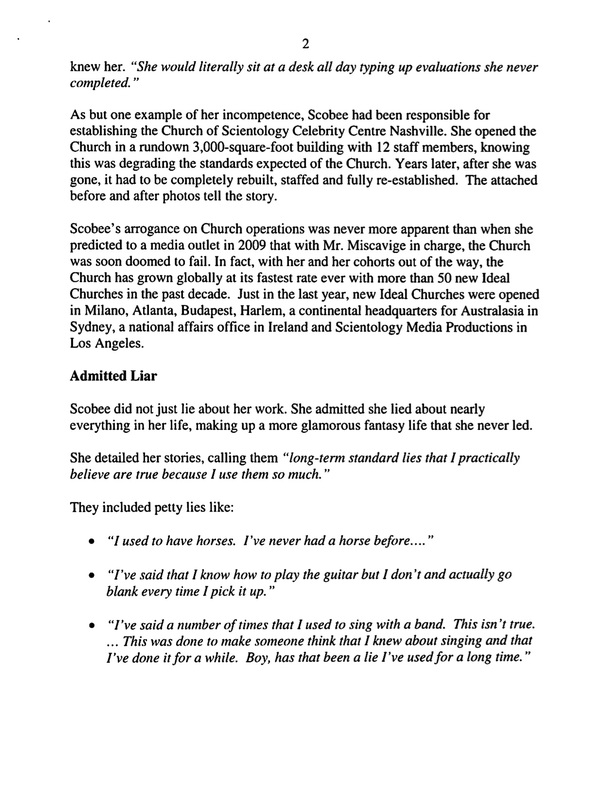 Upon learning of Ms. Remini's and Ms. Scobee's involvement, CSI sent letters to the "Aftermath" production providing information intended to discredit both women by criticizing their veracity and motives, and attacking their character. 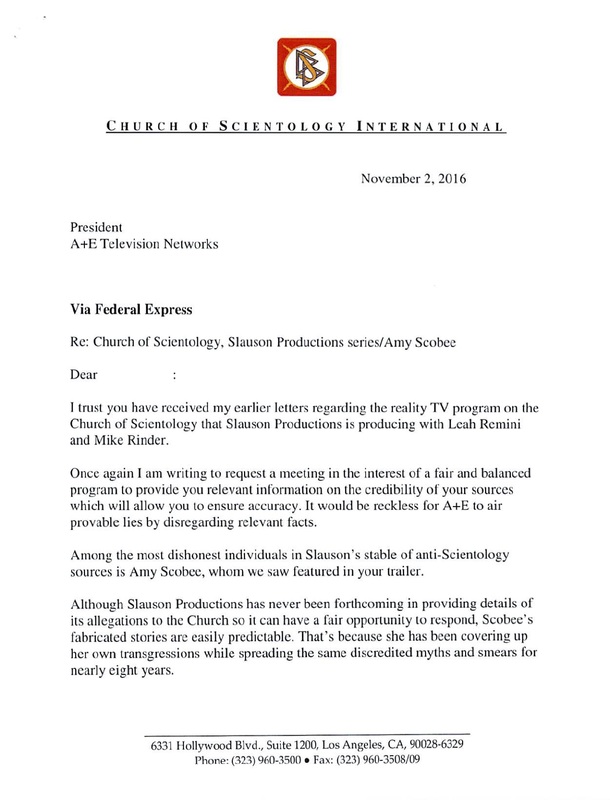 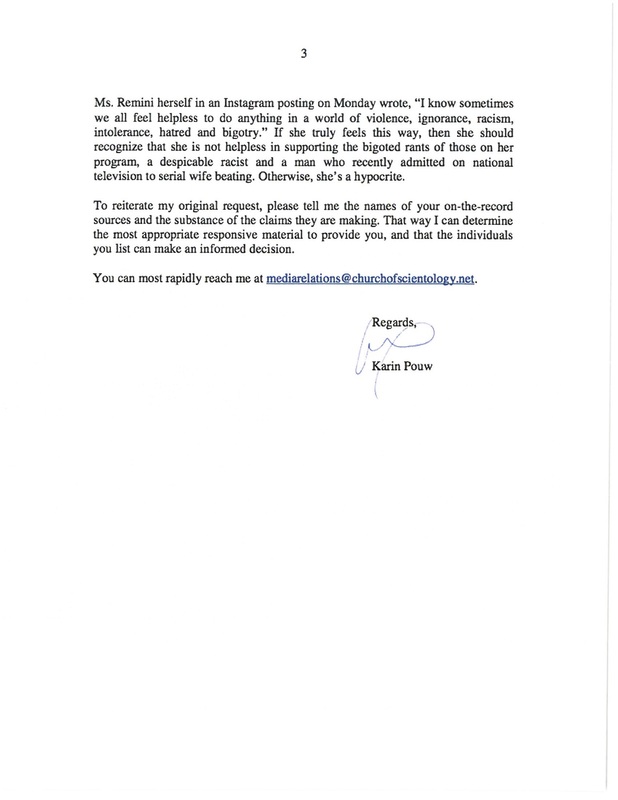 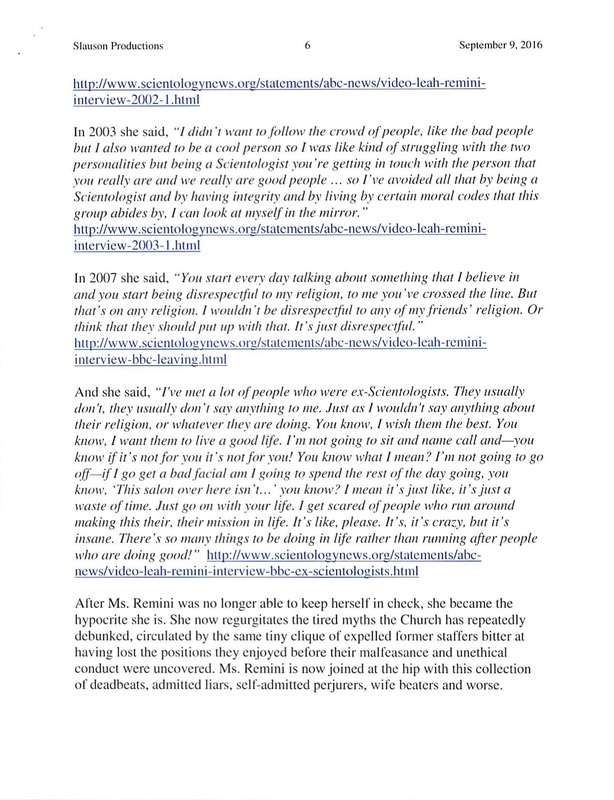 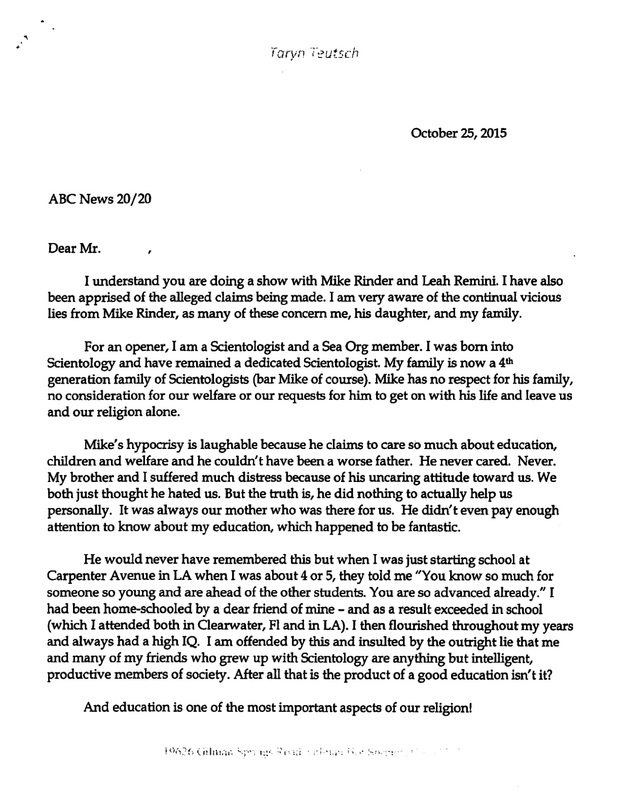 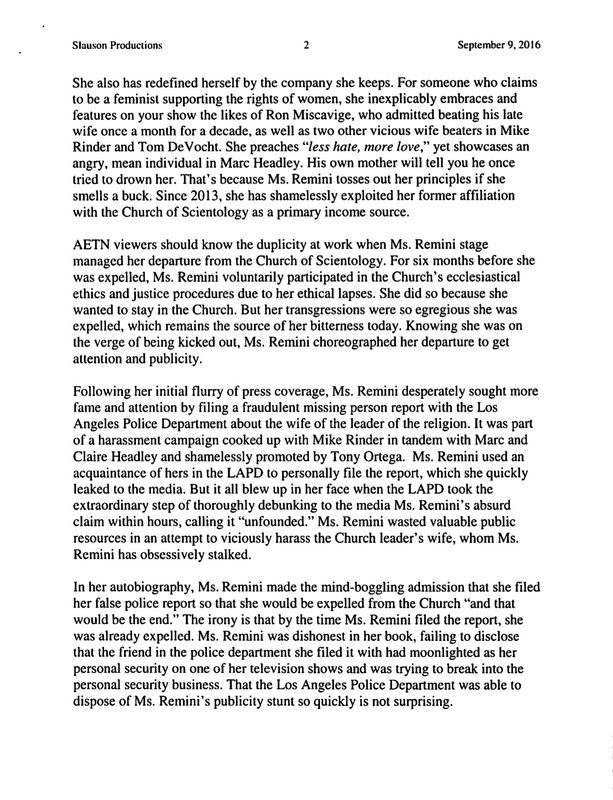 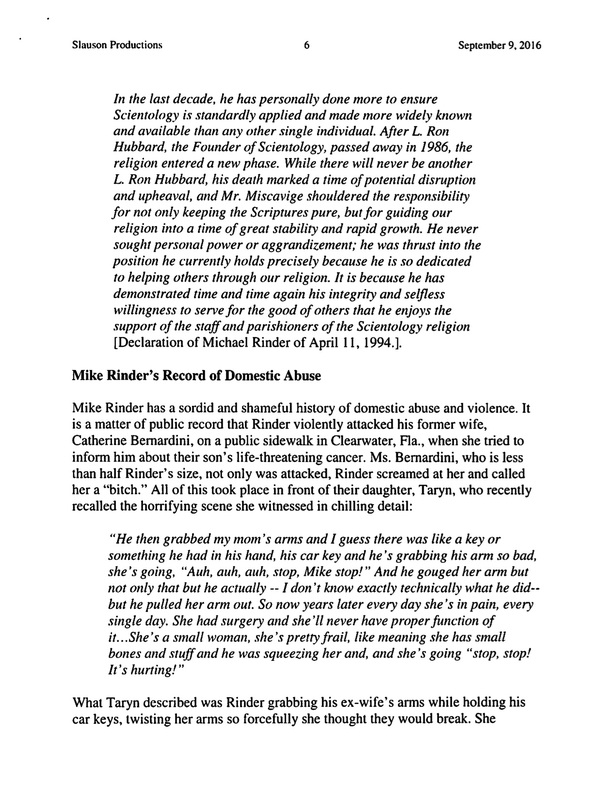 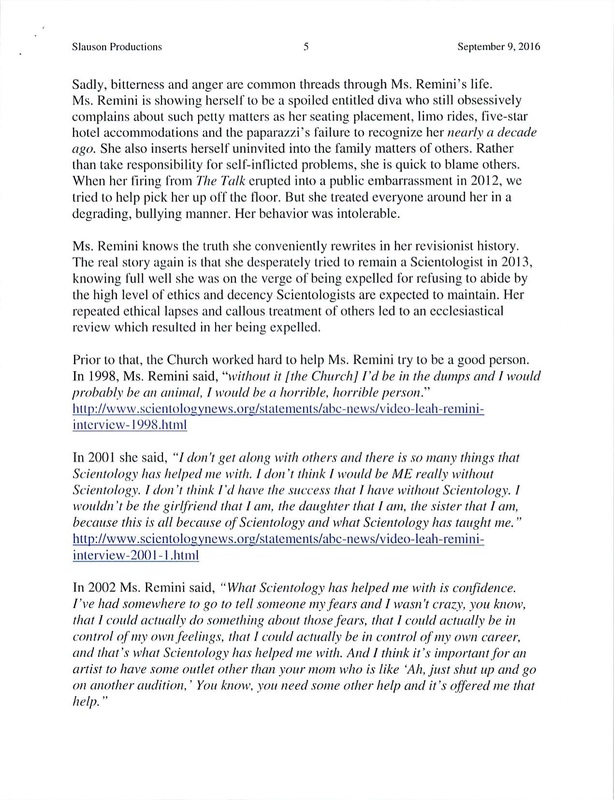 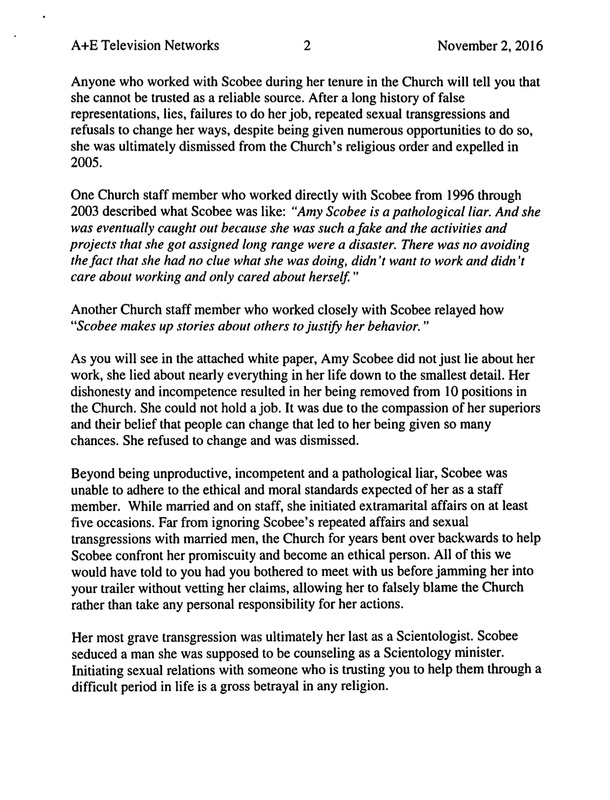 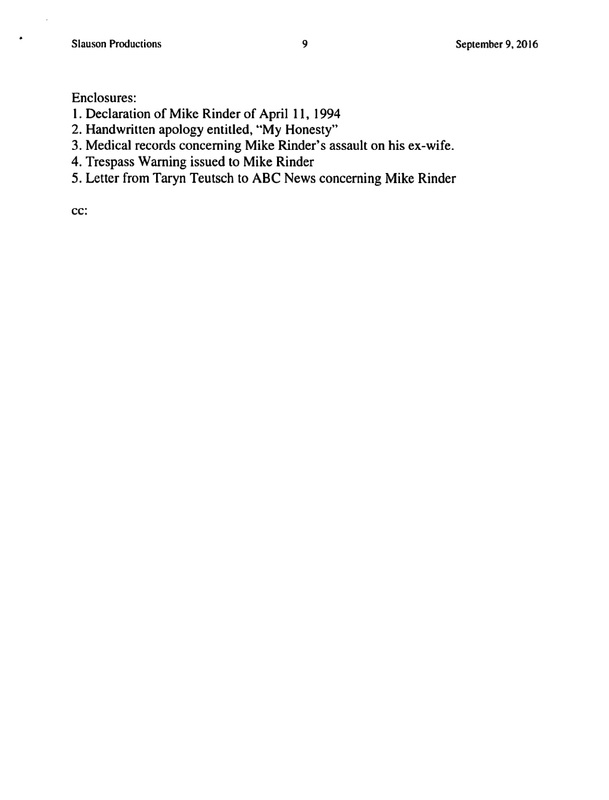 Although Ms. Remini is prominently featured in all eight episodes of the series, we include CSI's letter about her here along with the letter about Ms. Scobee and the Church's "White Paper" titled "Amy Scobee - Anti-Scientologist, Discredited Source" because she is a primary focus of the episode. 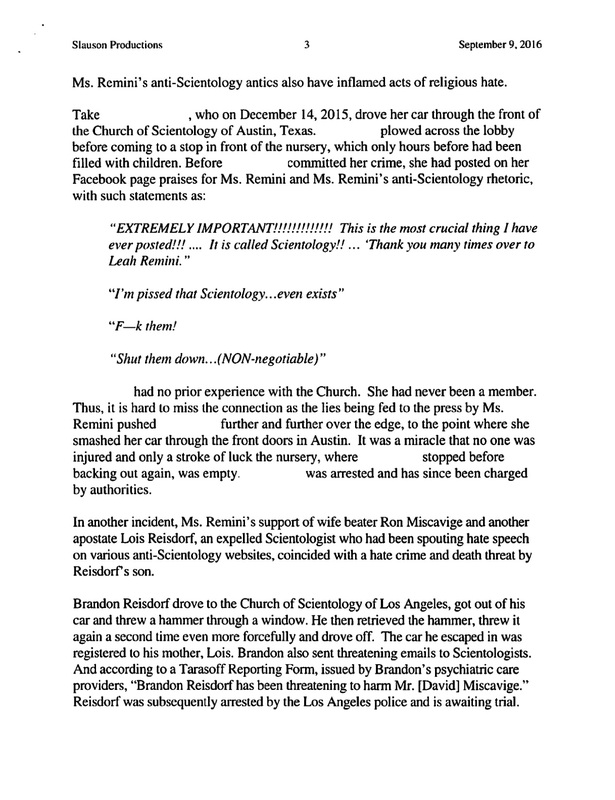 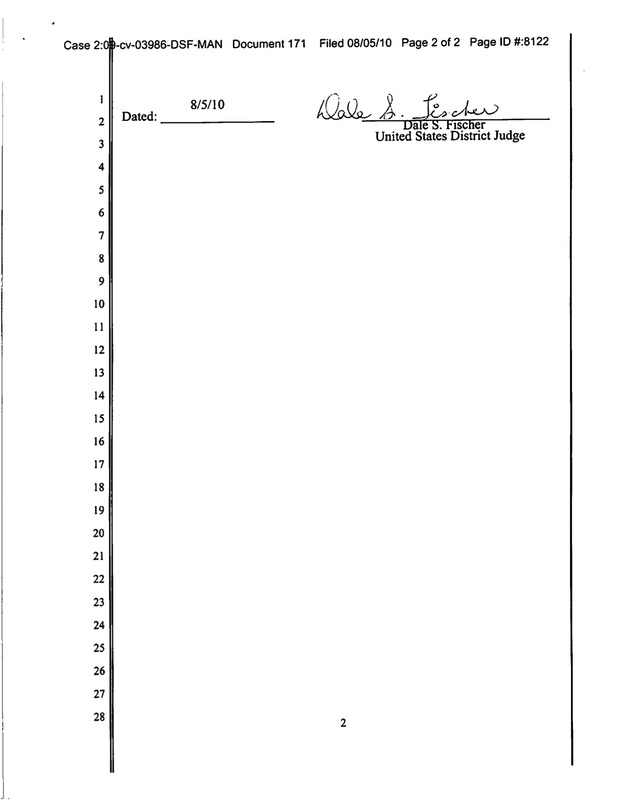 The letter regarding Ms. Remini has been redacted to protect the privacy of individuals not featured in this series. 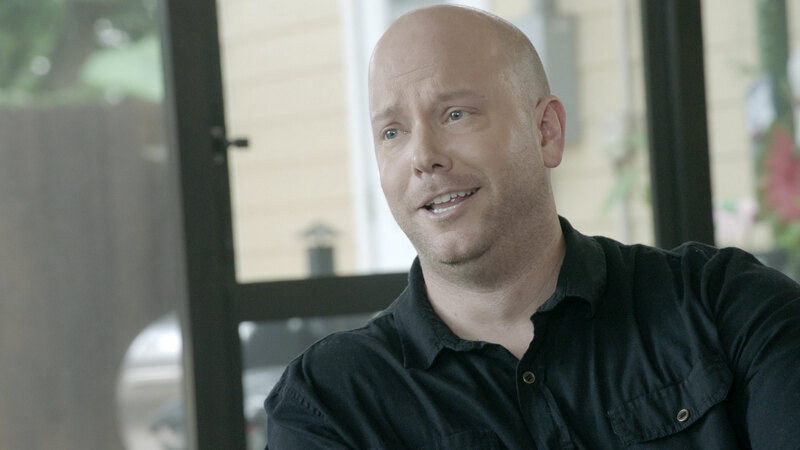 Watch the first full episode now.